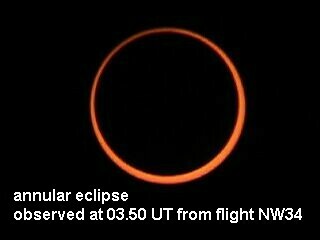 Olivier Staiger at 03:50 UT from Flight NW34. 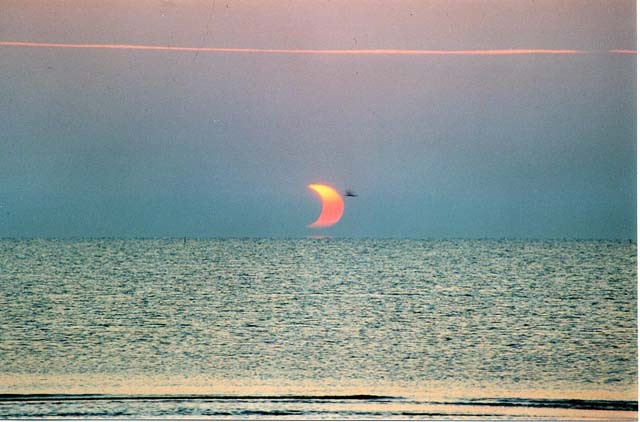 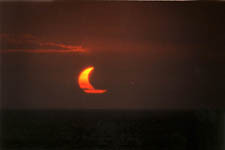 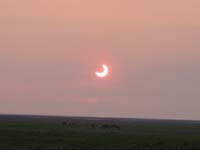 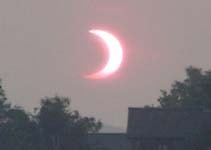 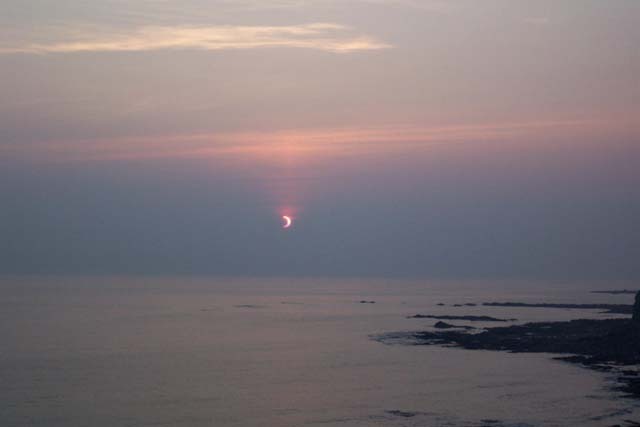 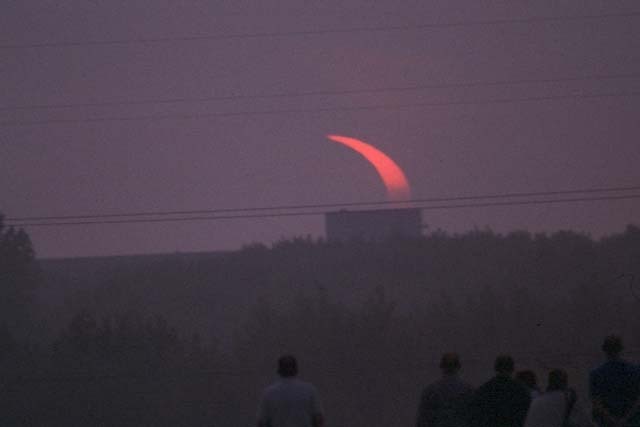 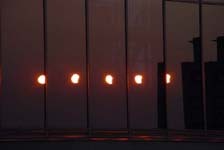 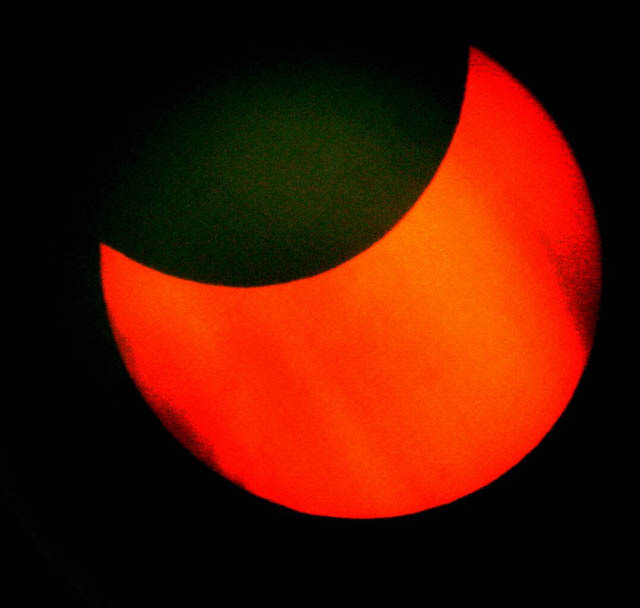 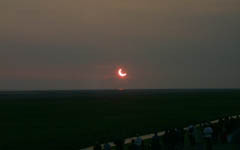 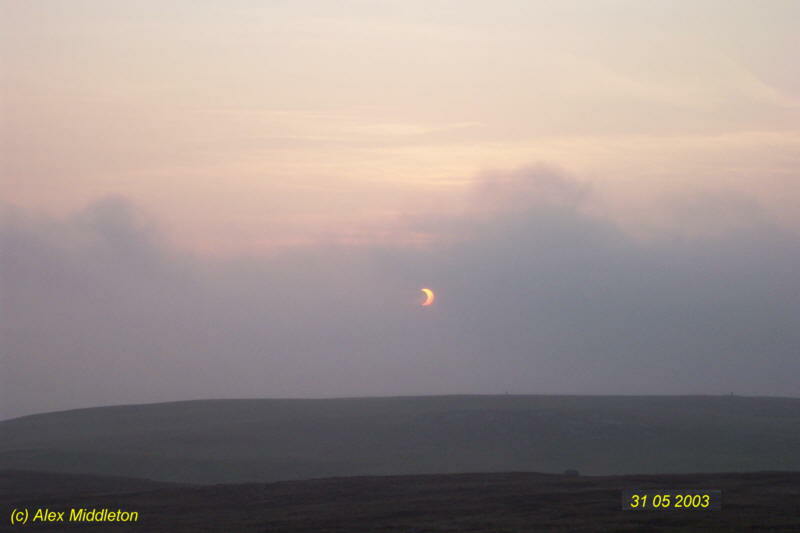 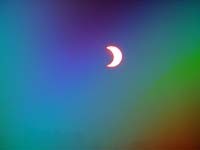 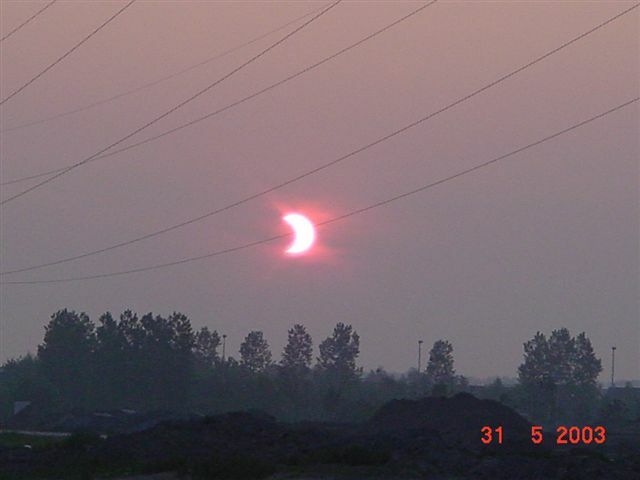 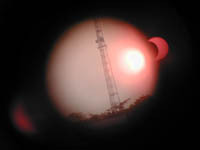 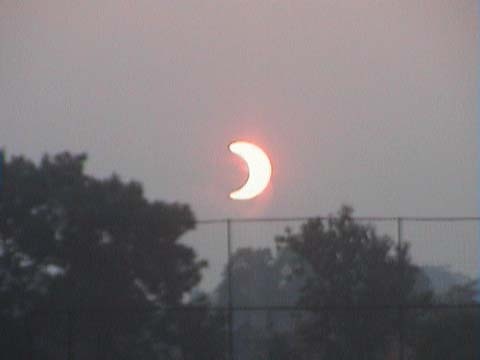 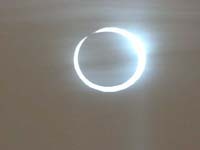 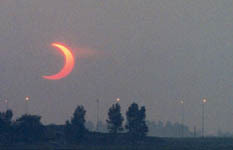 On Saturday, 2003 May 31, an annular eclipse of the Sun was visible from within a broad corridor which traverses the far Northern Hemisphere. 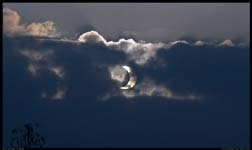 The path of the Moon's umbral shadow began in northern Scotland, and quickly swept across Iceland and portions of Greenland. 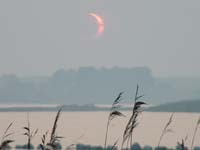 A partial eclipse was observed within the much broader path of the Moon's penumbral shadow, which included most of Europe (except Spain and Portugal) and the Middle East as well as from central and northern Asia. 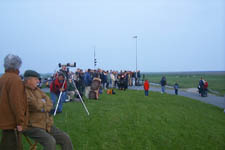 Astronet, Copernicus Public Observatory and Mira Public Observatory, in cooperation with the Dutch educational website Kennislink ("Knowledge Link") organised a live webcast of the event from the Netherlands and Belgium. 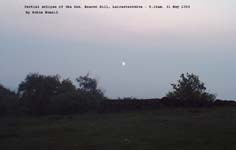 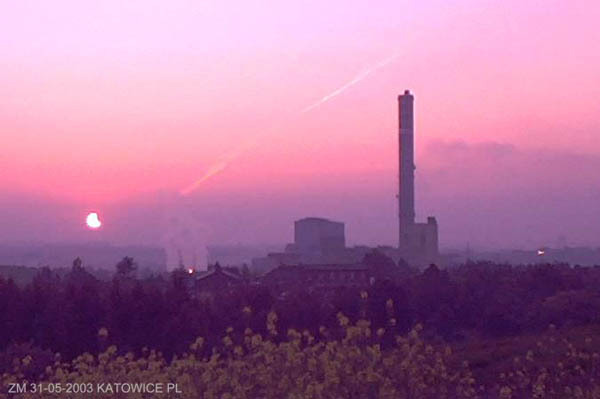 The live webcast took place on Saturday, May 31st from about 03:20 to 04:45 UTC. Astronet received many outstanding pictures by enthousiastic photographer from The Netherlands, Belgium, Scotland, England, Danmark and Norway. 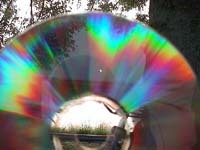 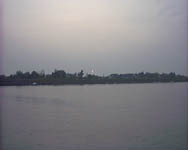 These pictures are shown on this page. Where no country is mentioned the picture was taken in The Netherlands. 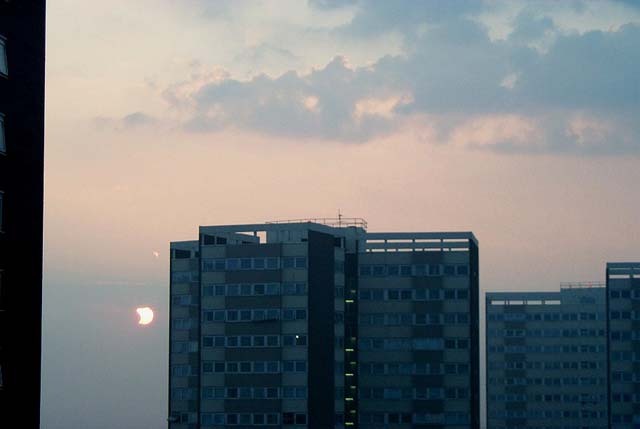 Reijnoud van der Niet, Rotterdam. 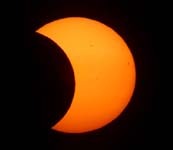 The partial phase of the solar eclipse began at 1:46 UT and ended at 6:30 UT. 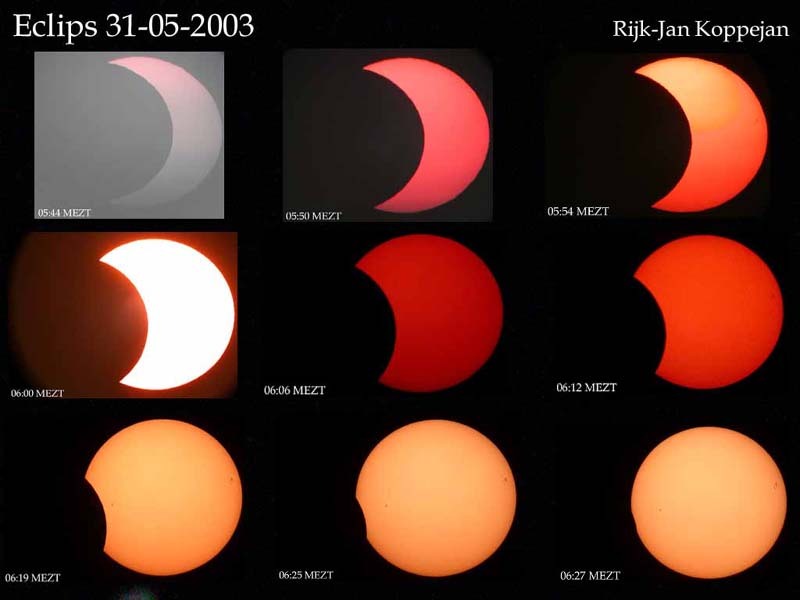 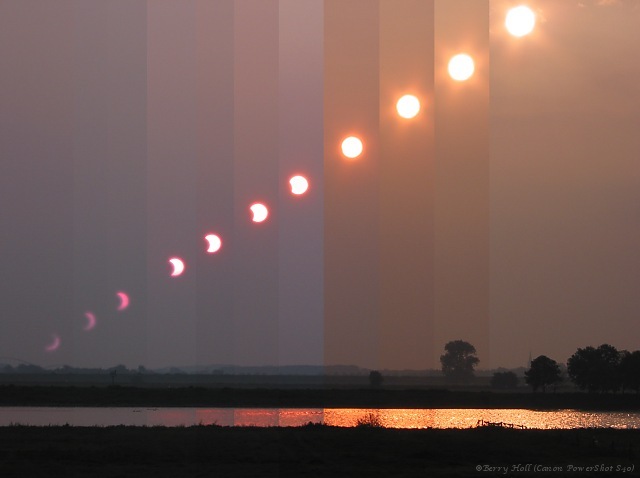 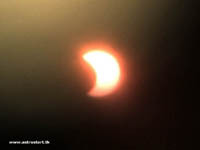 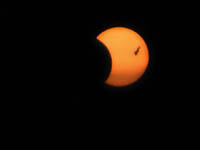 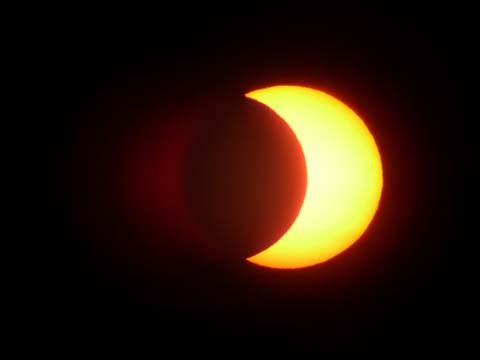 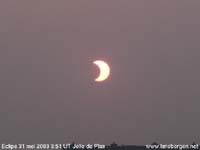 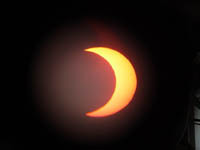 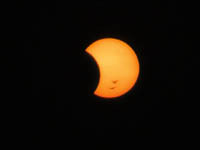 The partial phases of the eclipse, the magnitude decreasing as the distance from the track increases, could be seen from Europe (except the south west), the extreme northeast of Africa, northern and western Asia, much of Greenland, northwestern parts of north America and Arctic regions. 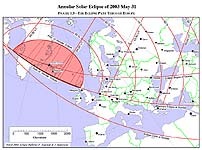 The central line of the annular phase began at 4:02 UT in the north Atlantic Ocean to the southwest of Iceland and swept in a tight curve across western Iceland and the Denmark Strait to end at 4:14 UT in the north Atlantic Ocean, just off the Greenland coast. 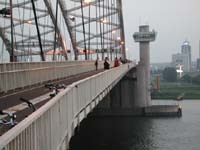 Along this line the length of annularity remained almost constant - about 3m 37s. The Sun was low along all of the central line; nowhere does its altitude exceed 3º. 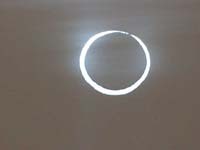 antumbral eclipse in greater detail. 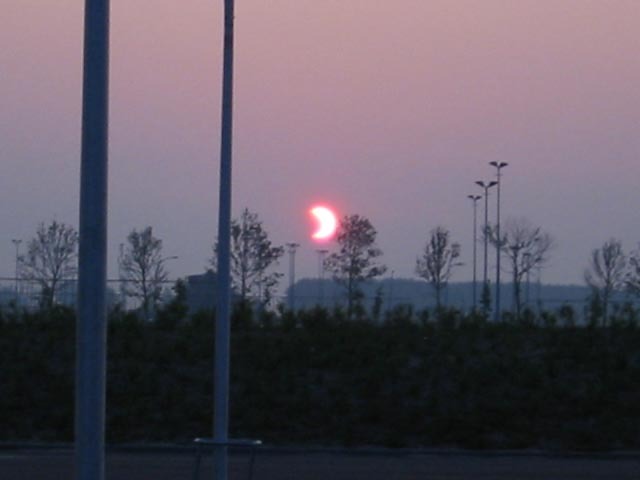 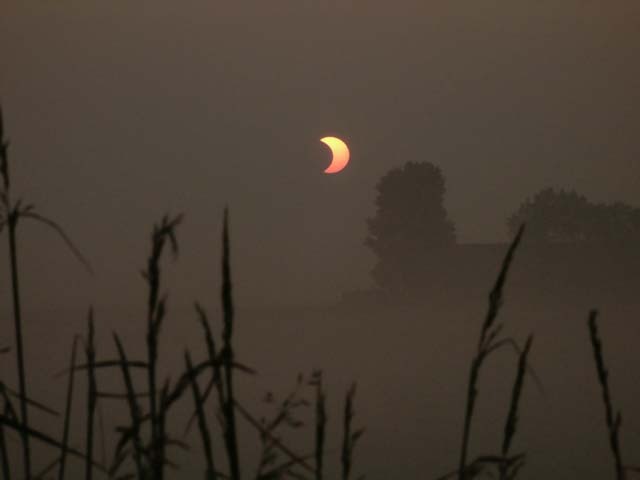 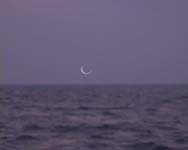 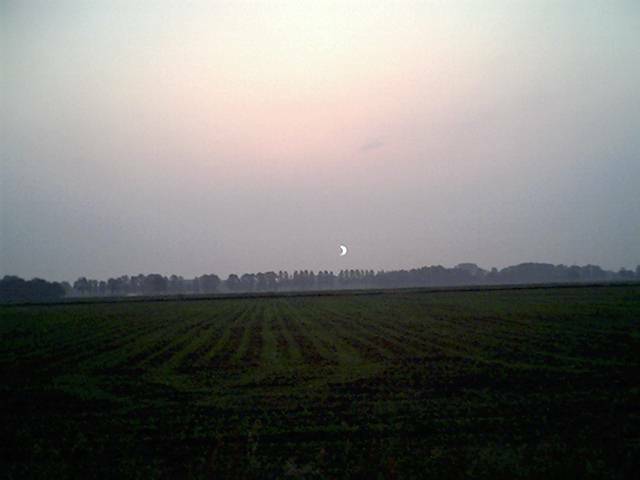 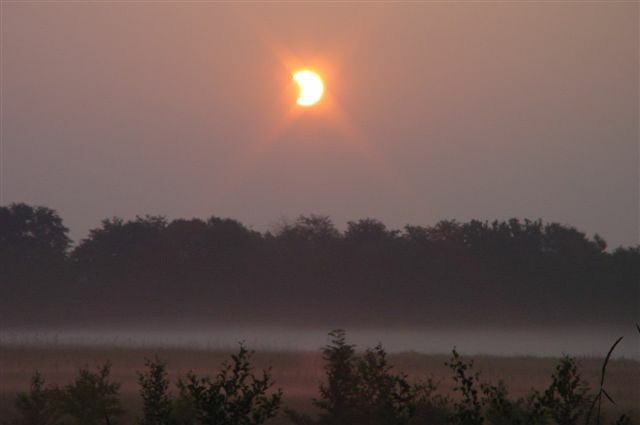 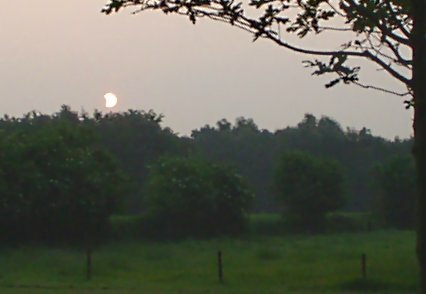 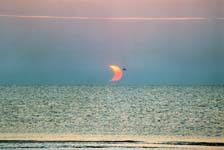 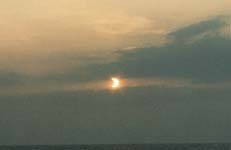 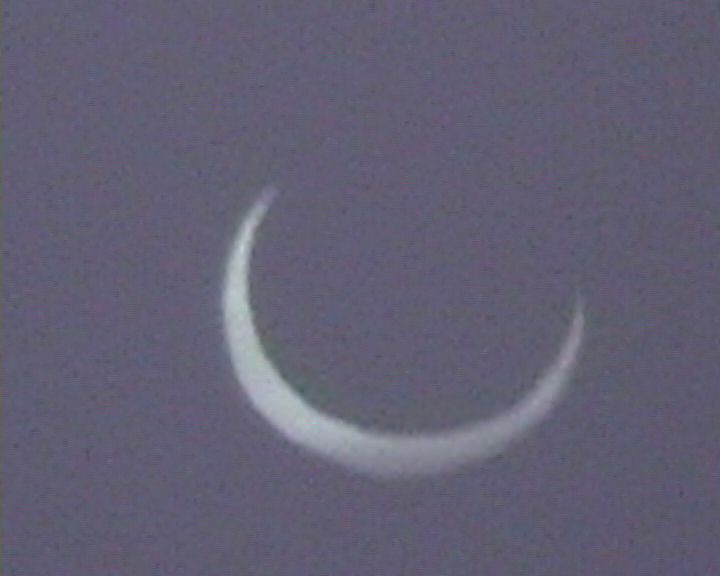 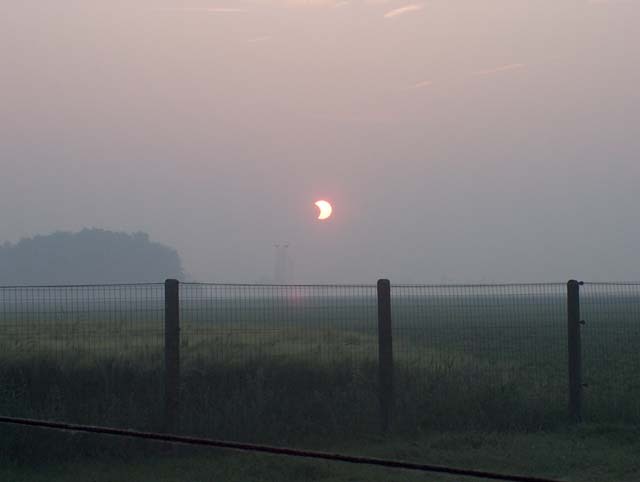 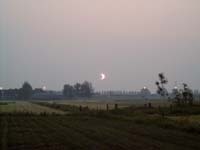 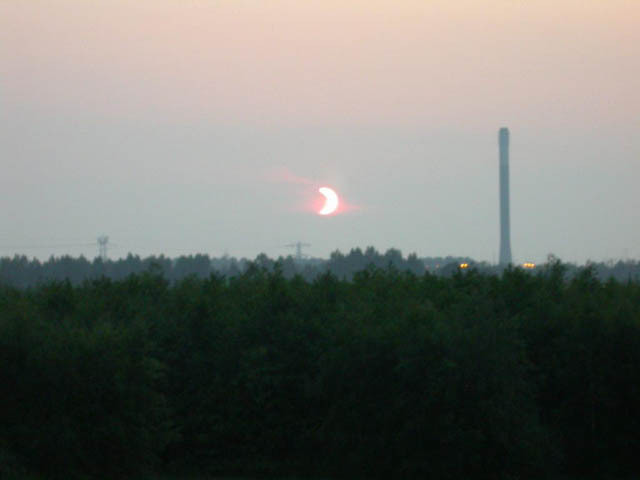 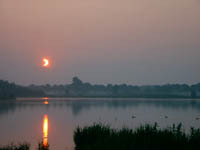 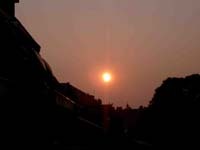 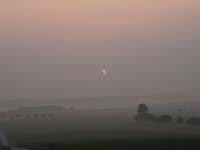 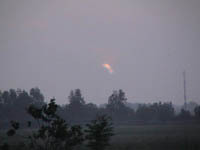 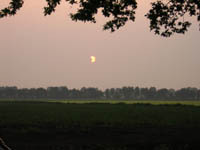 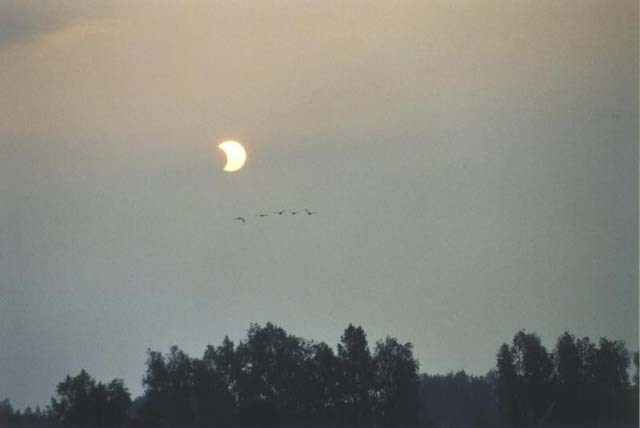 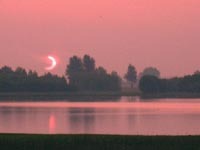 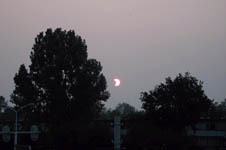 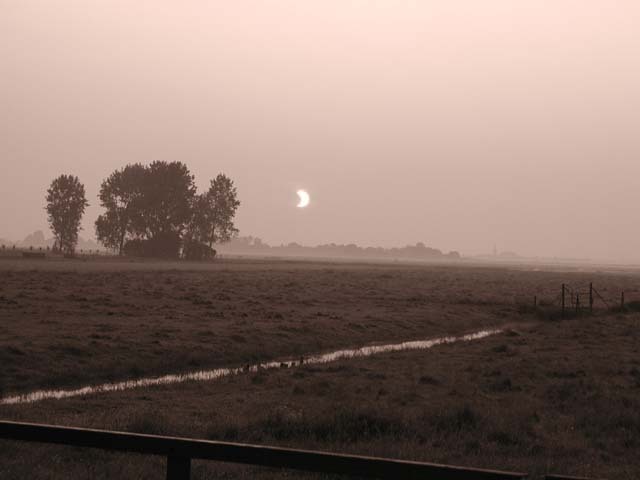 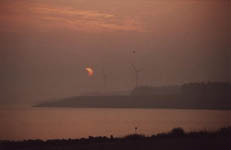 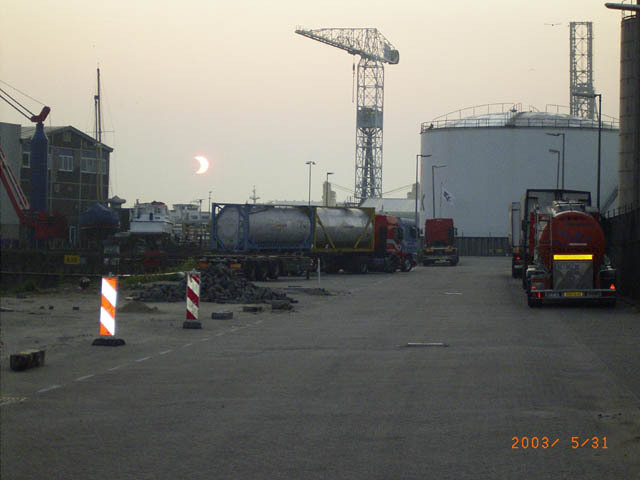 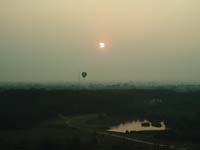 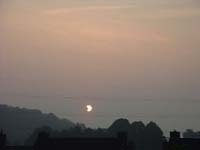 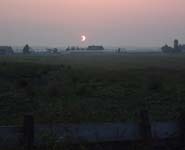 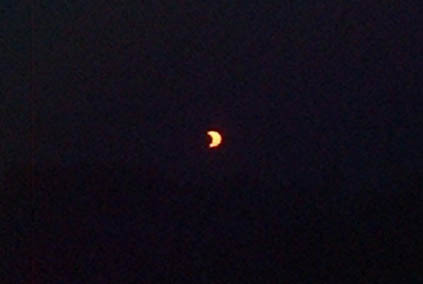 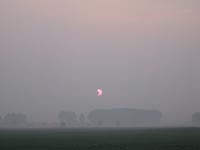 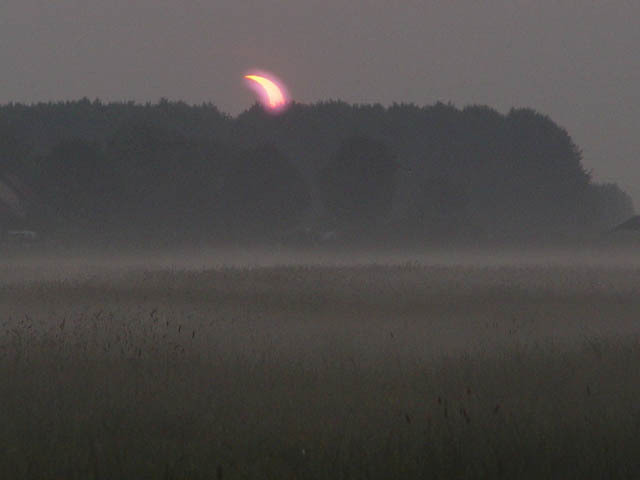 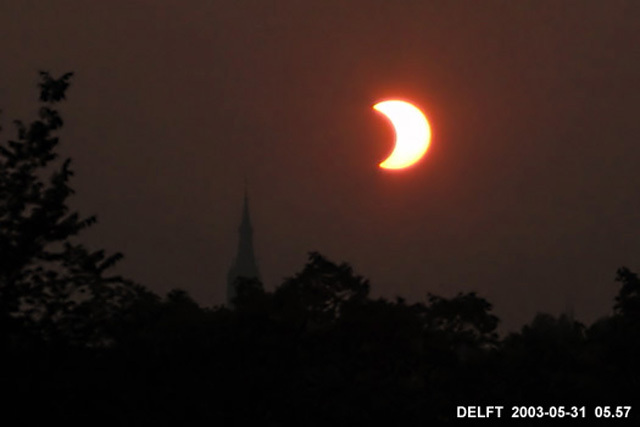 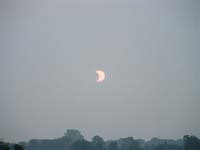 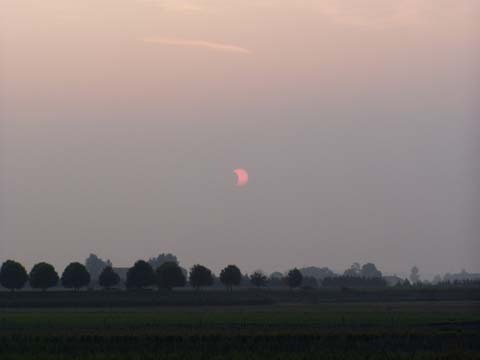 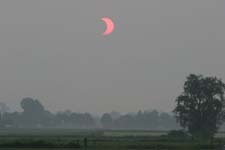 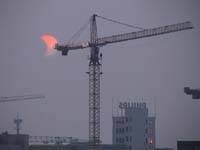 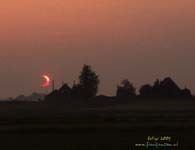 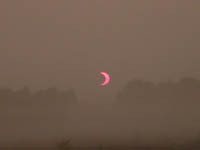 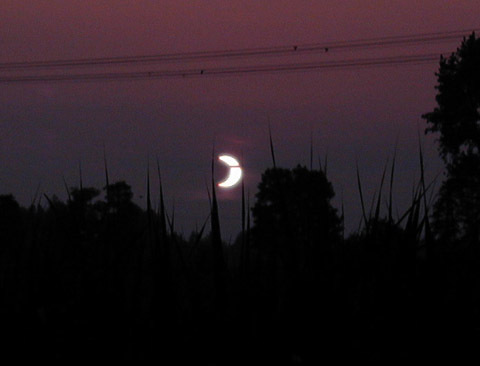 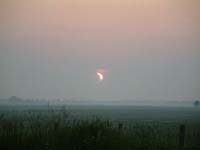 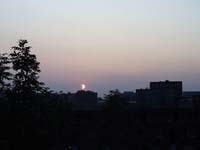 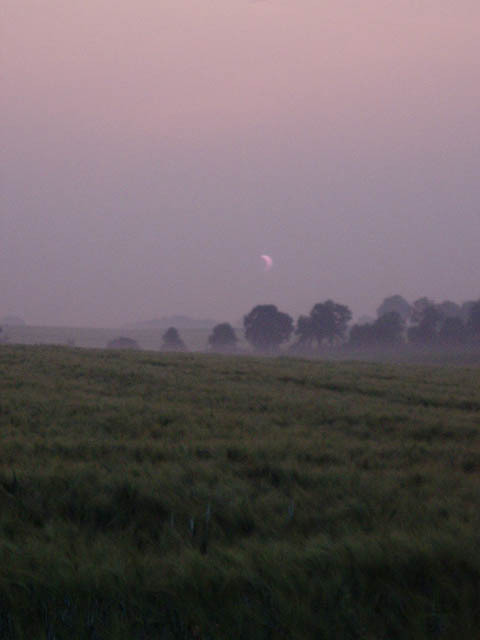 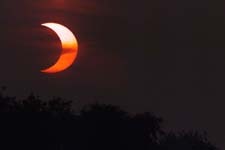 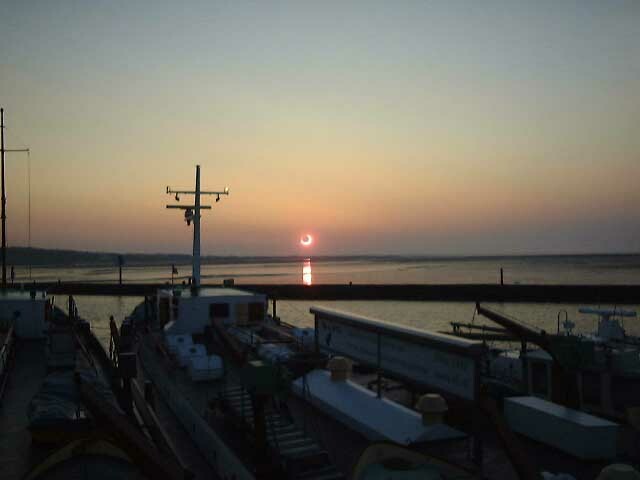 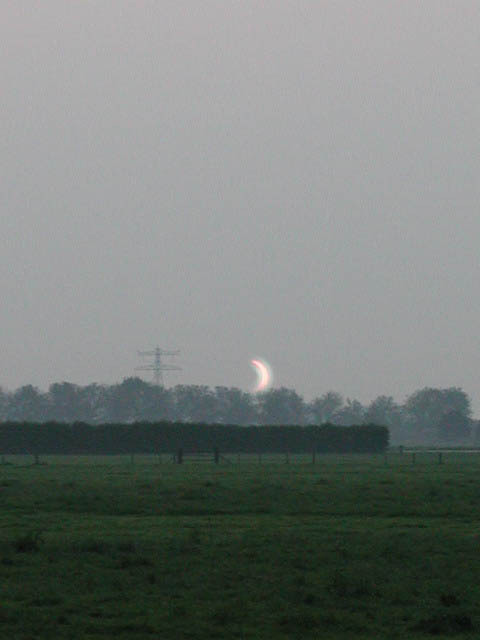 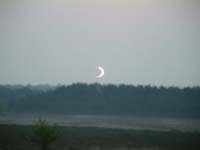 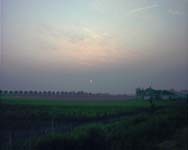 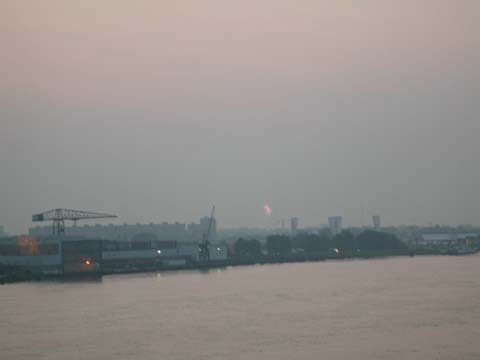 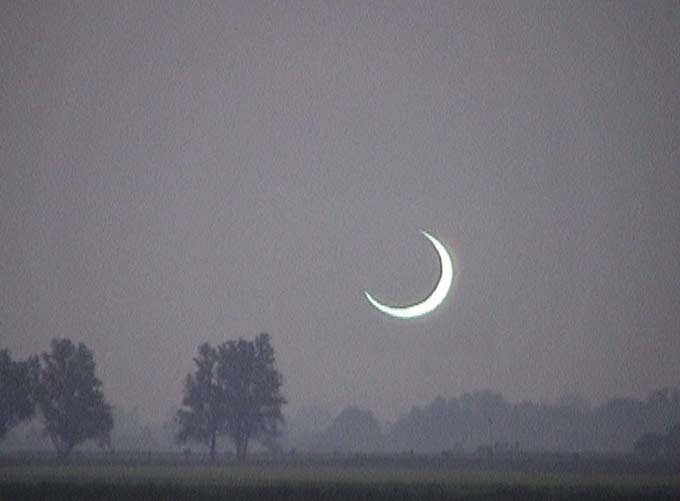 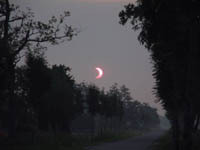 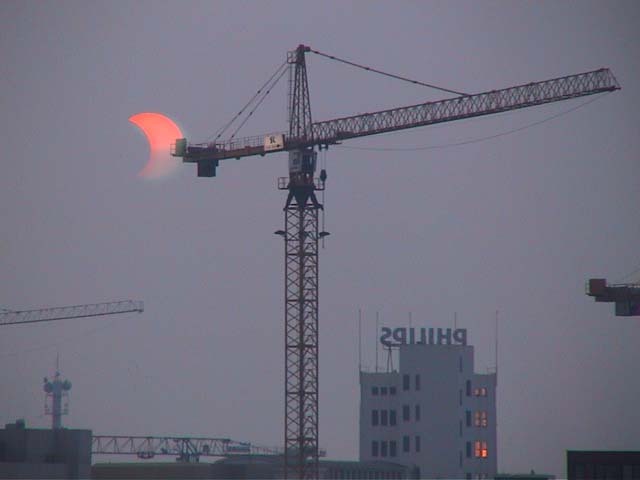 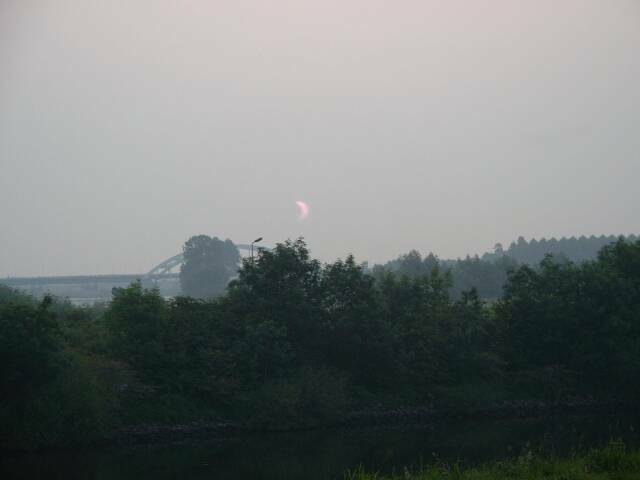 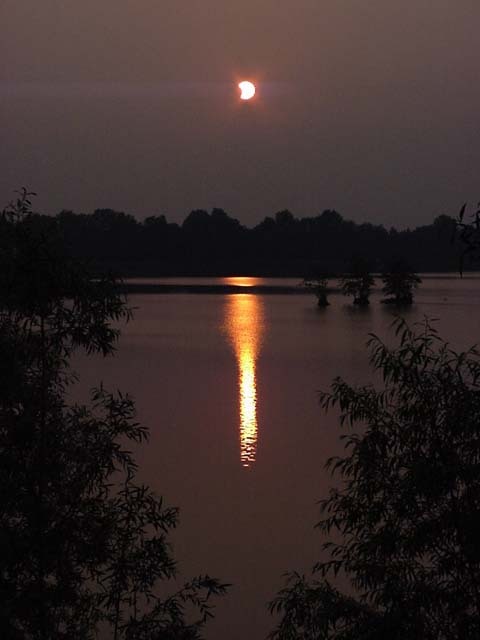 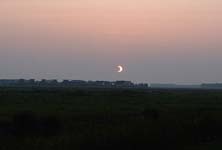 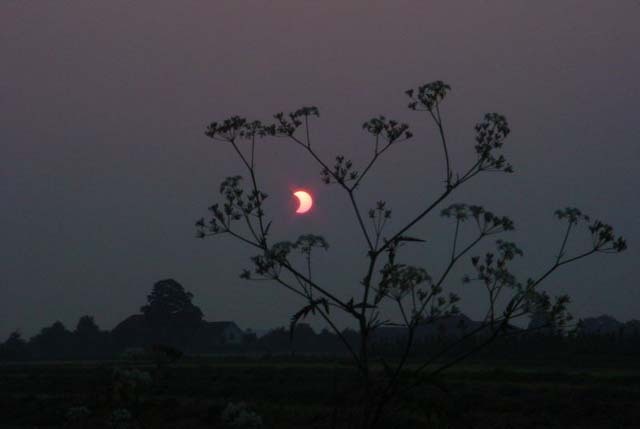 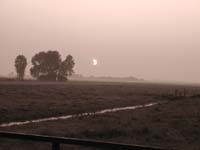 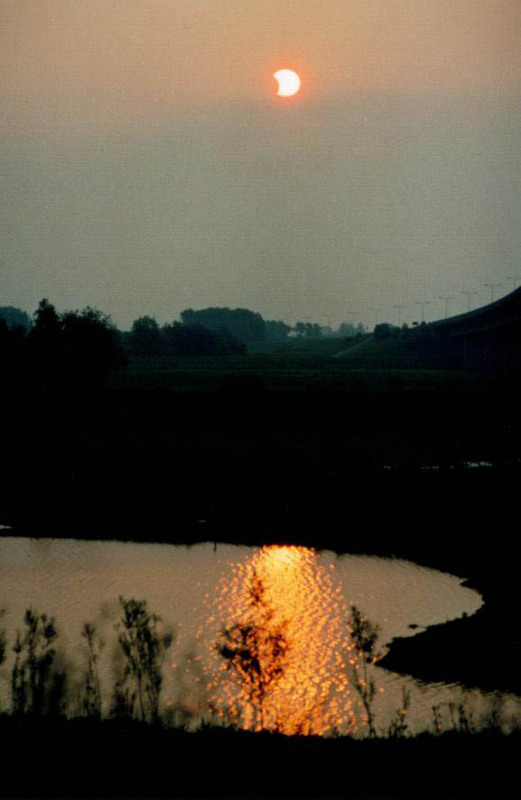 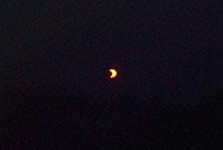 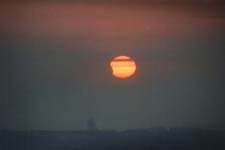 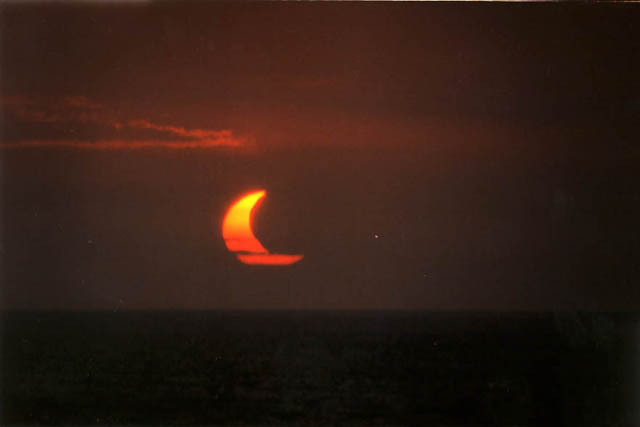 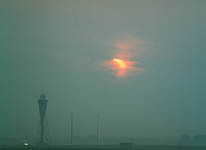 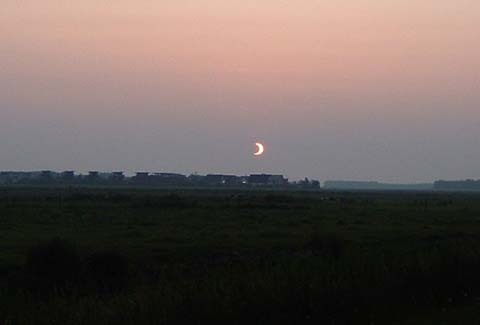 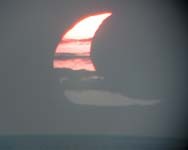 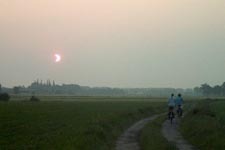 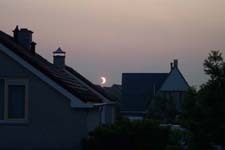 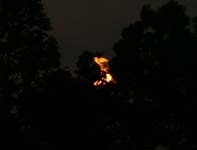 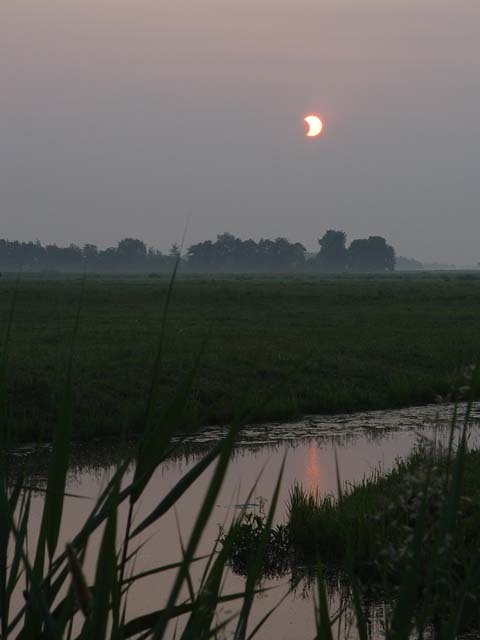 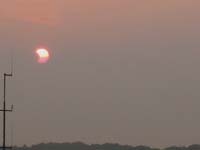 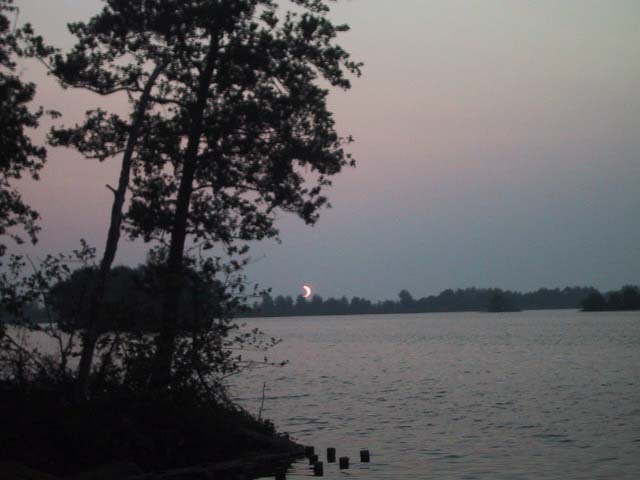 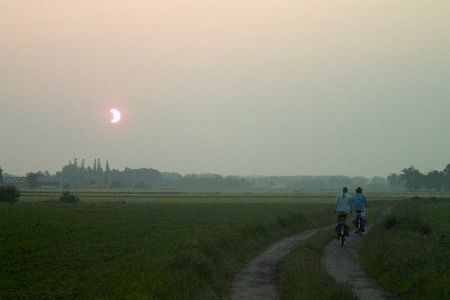 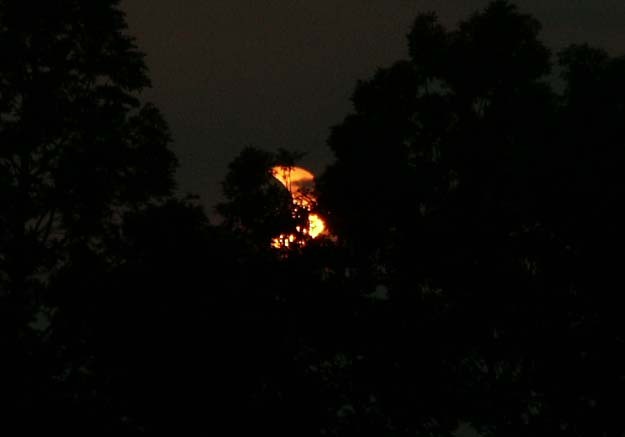 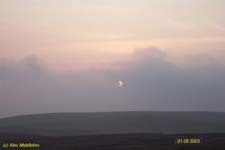 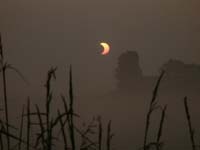 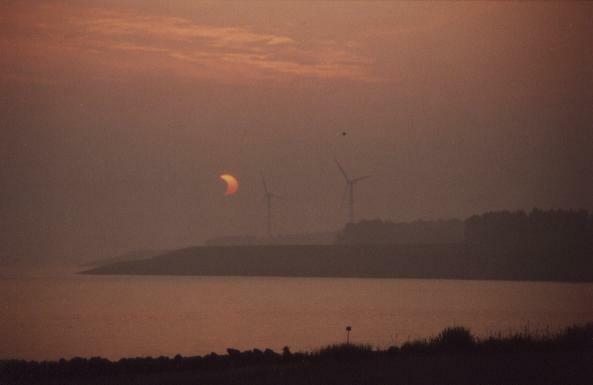 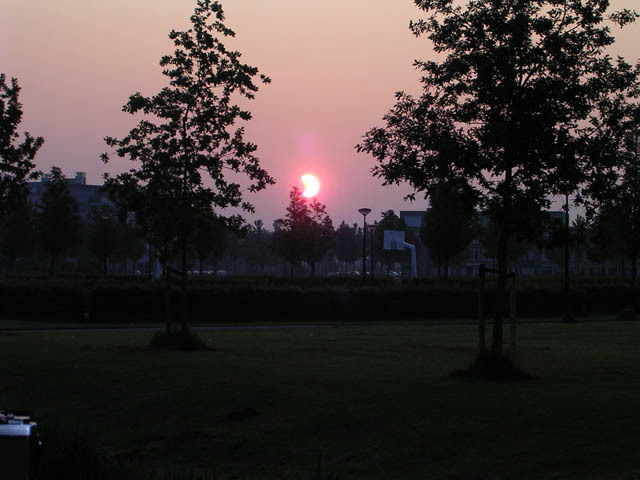 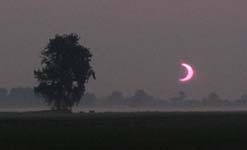 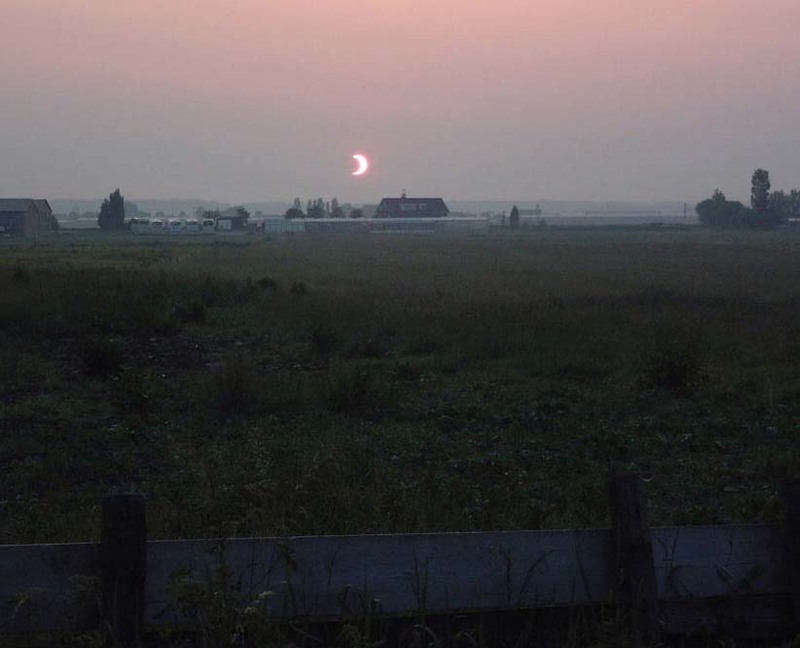 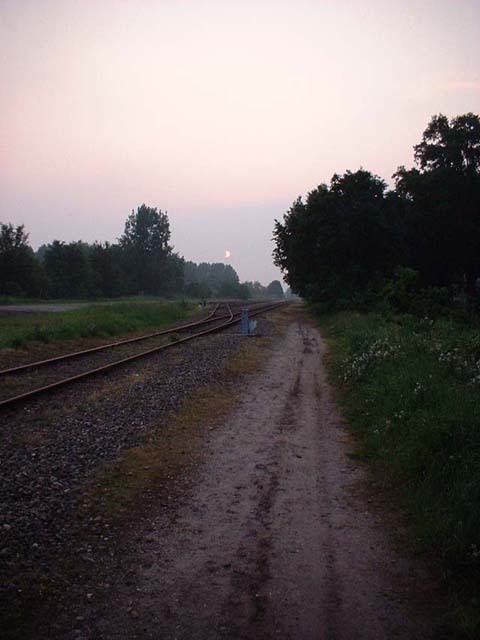 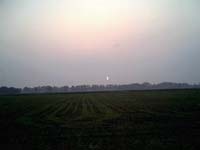 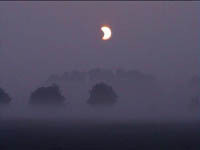 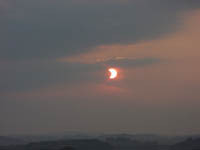 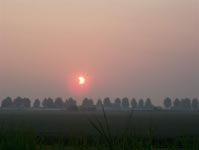 In northern Europe a large partial eclipse was visible the early morning. 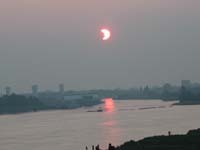 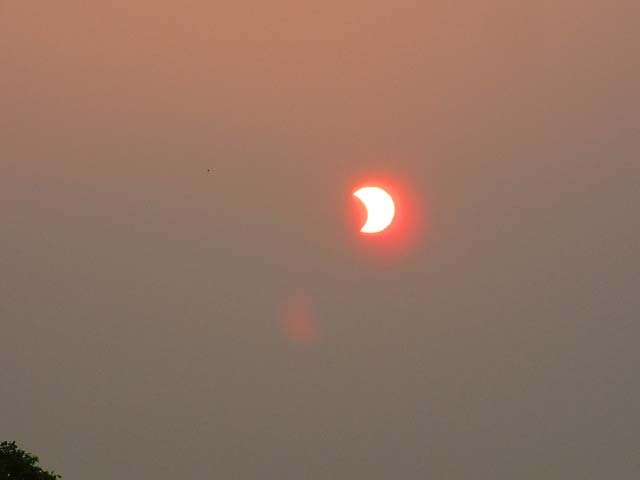 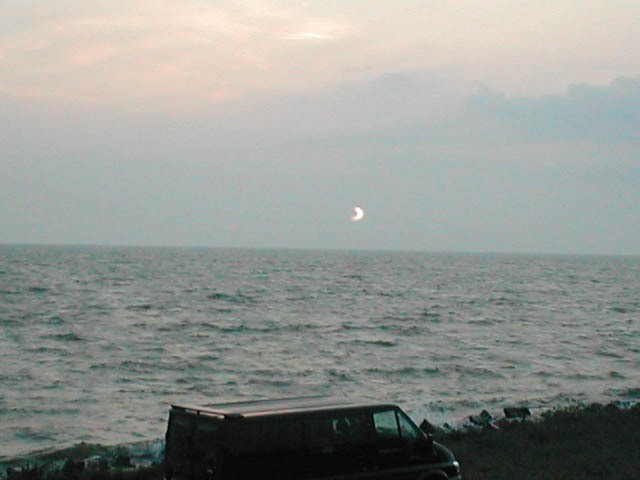 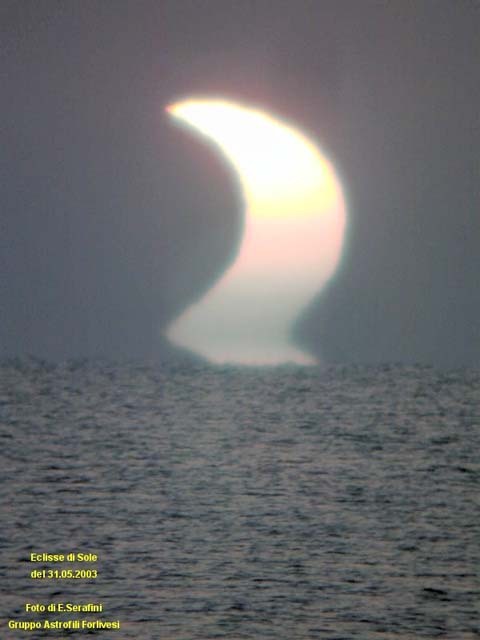 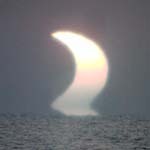 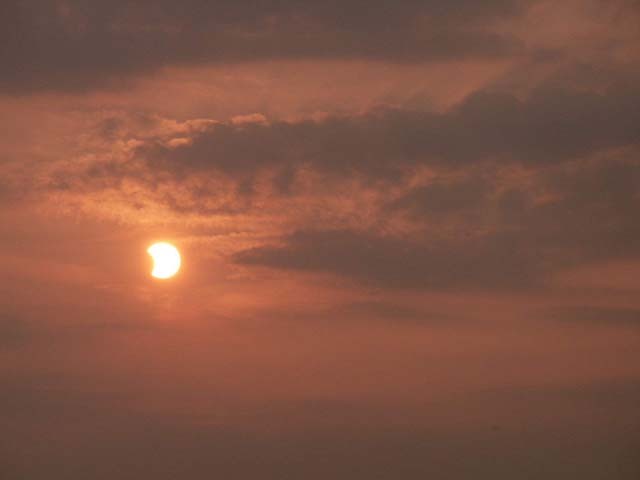 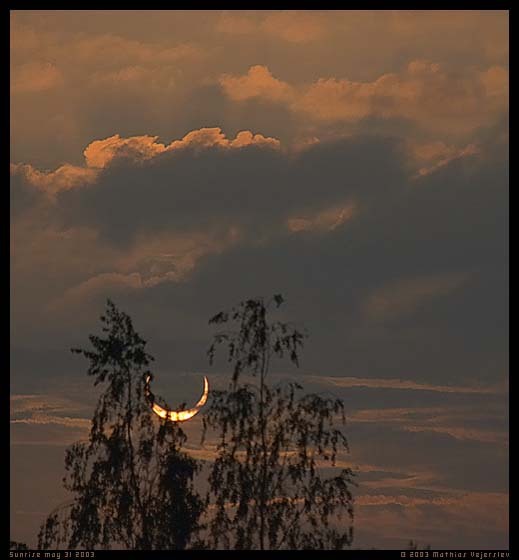 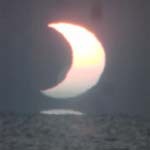 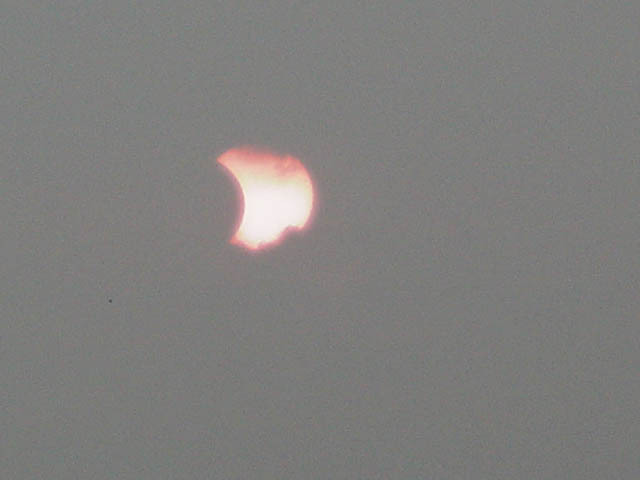 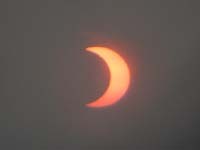 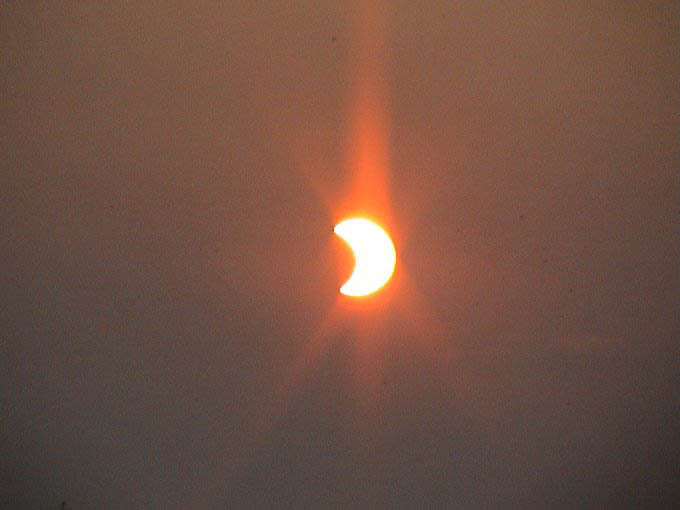 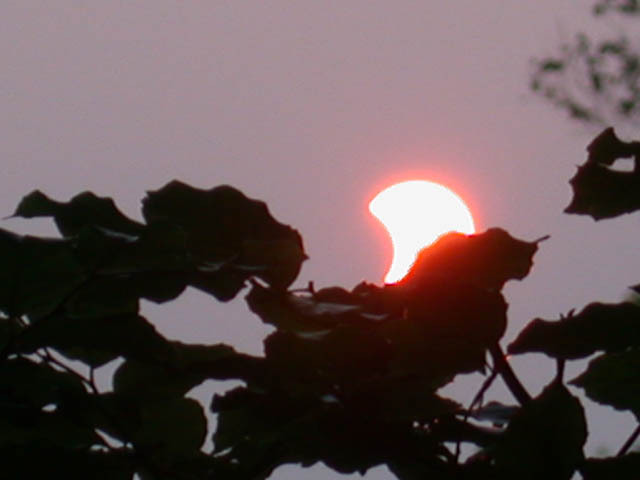 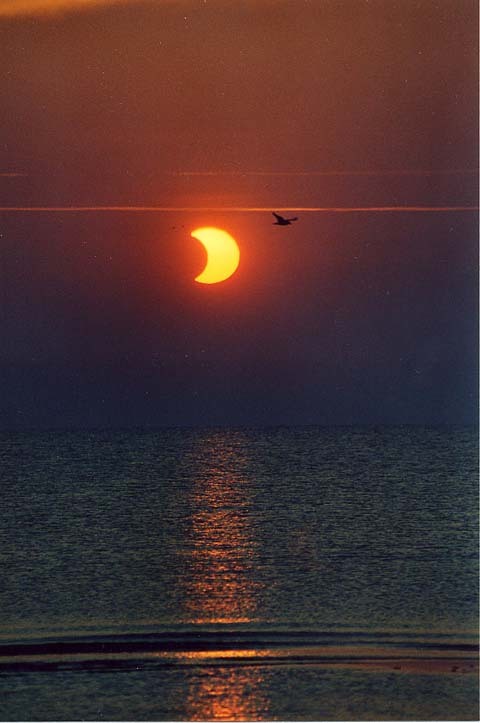 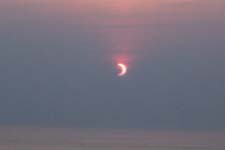 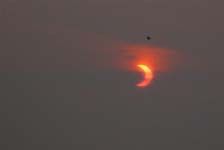 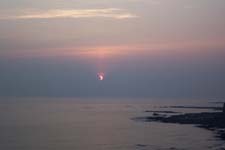 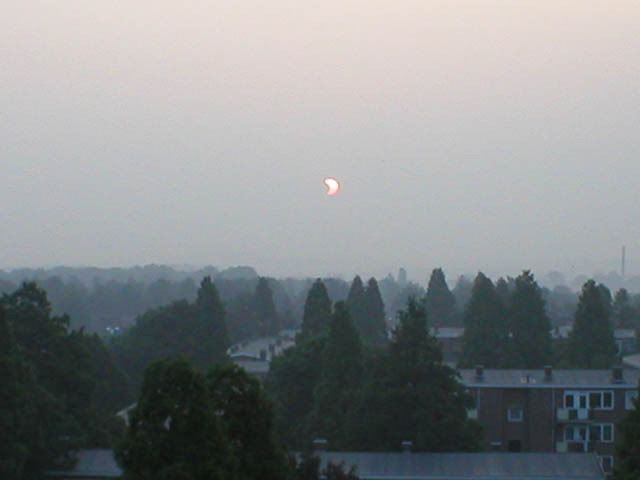 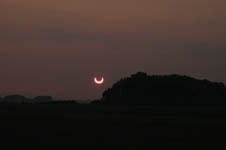 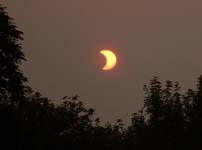 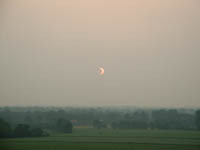 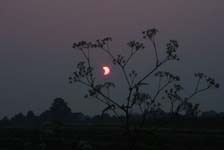 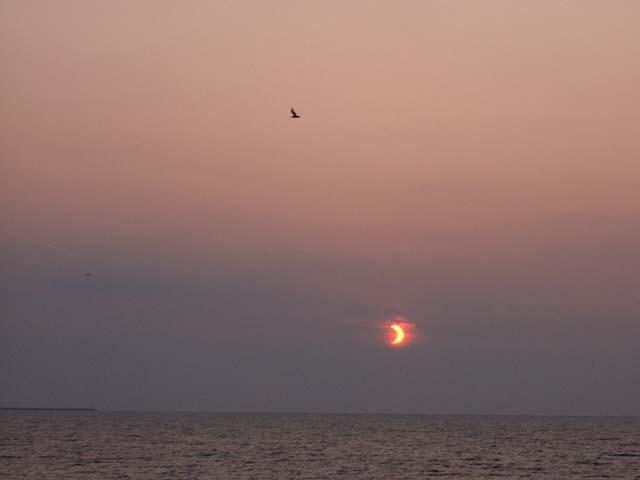 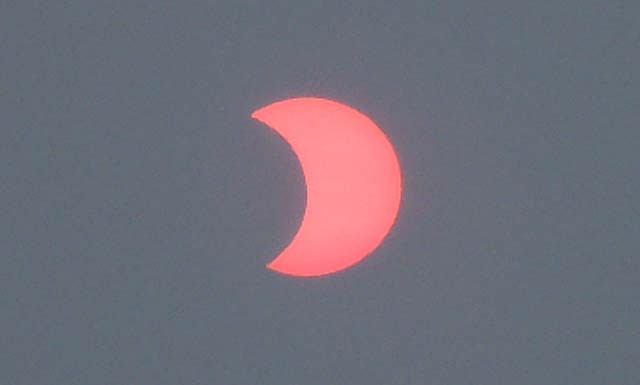 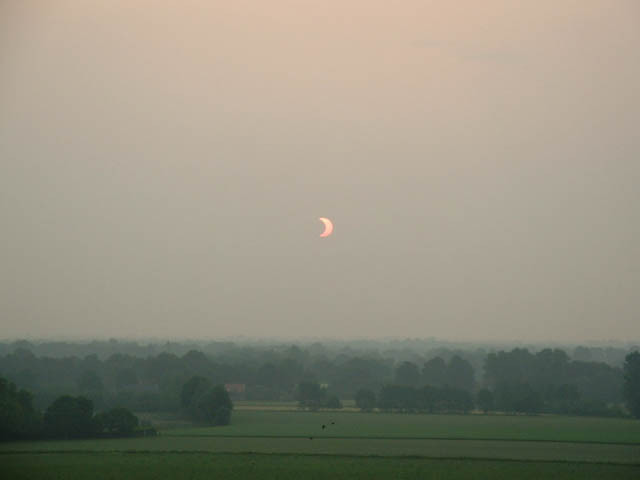 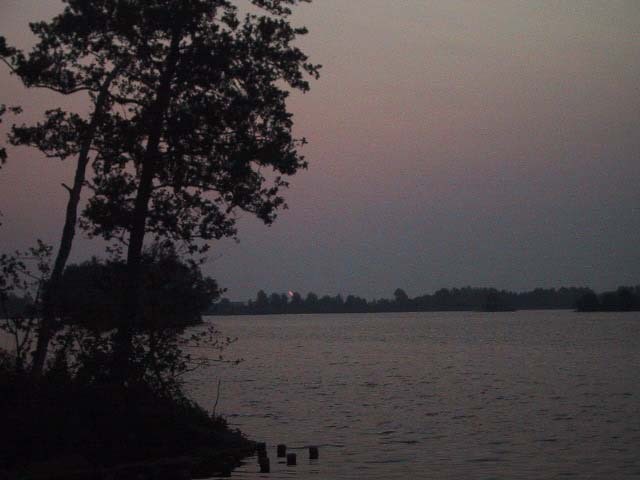 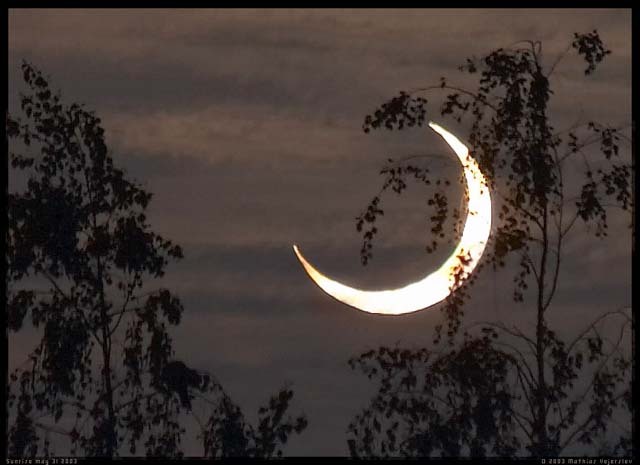 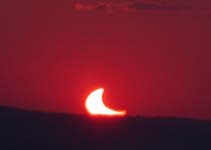 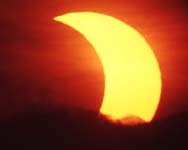 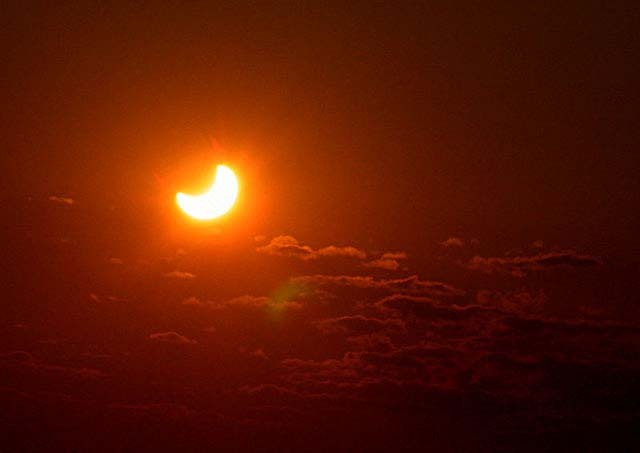 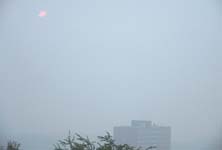 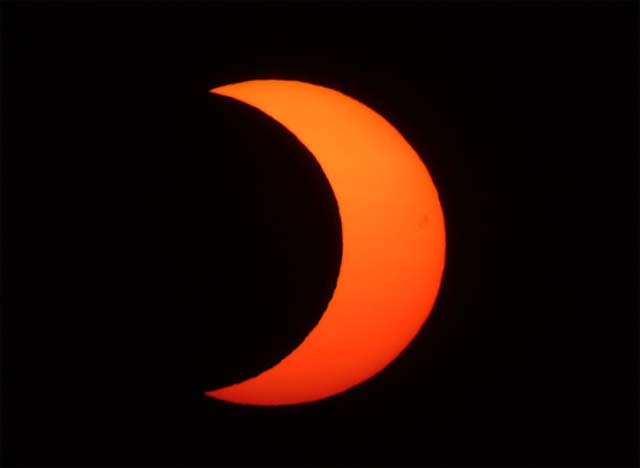 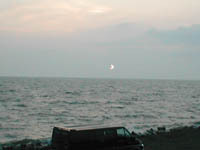 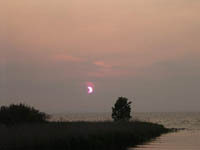 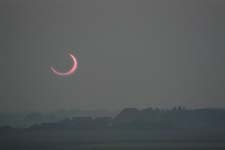 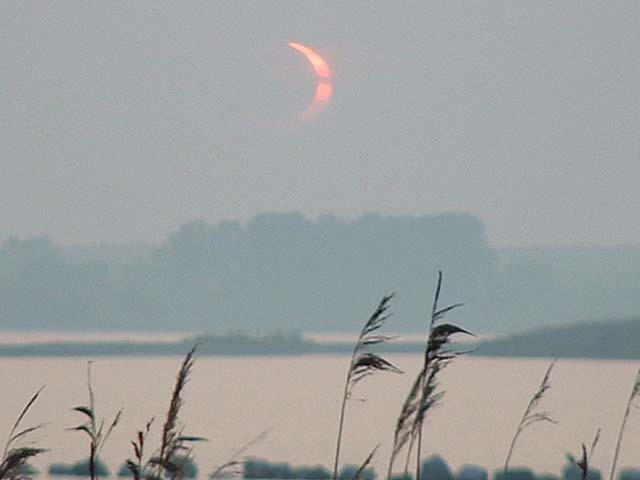 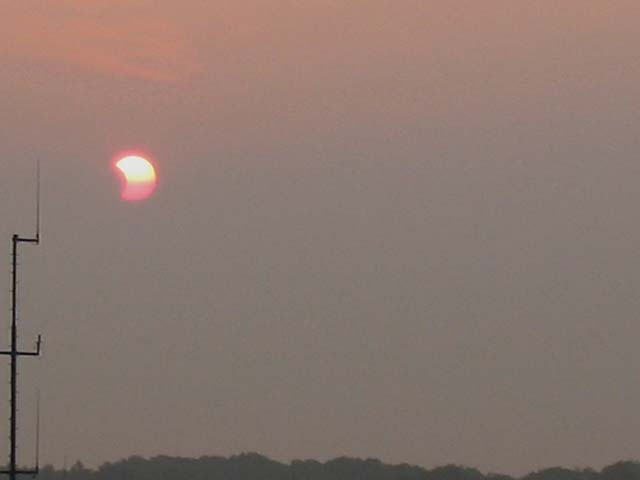 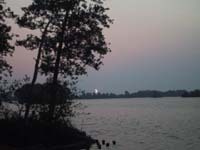 For Scandinavian observers, the eclipse began just after sunrise, so that the entire event was visible. 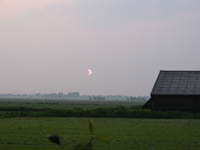 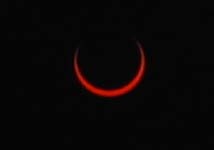 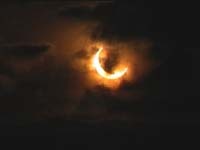 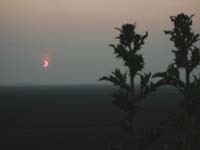 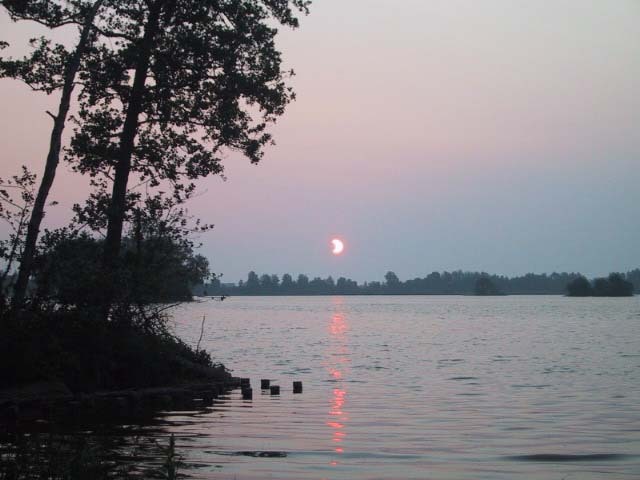 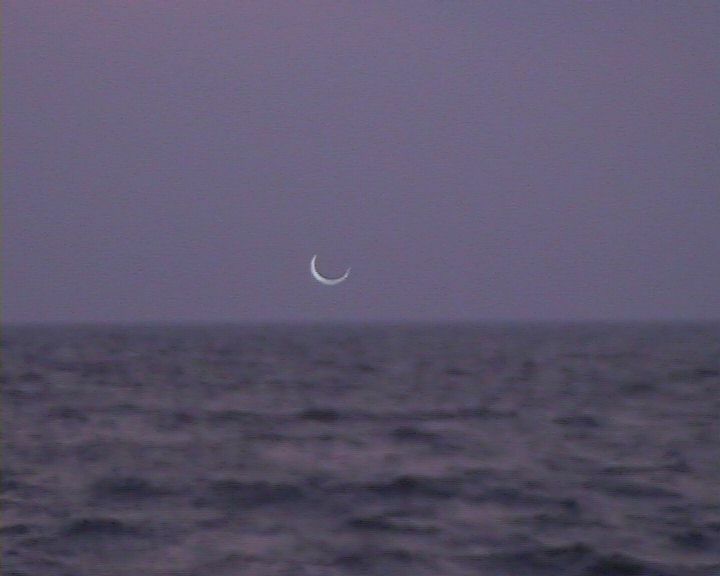 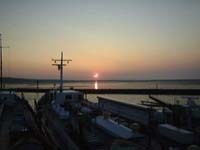 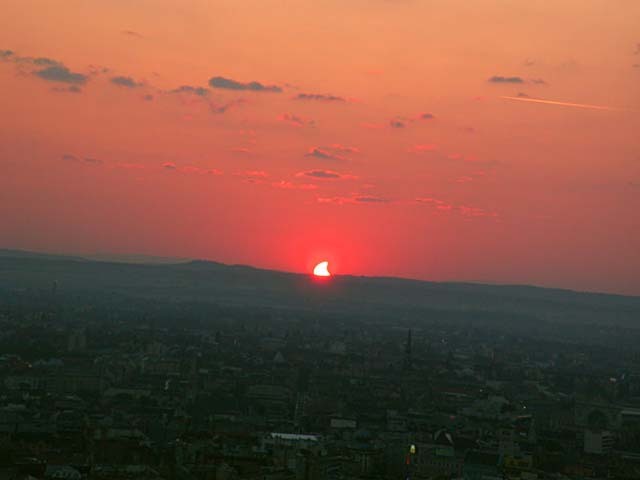 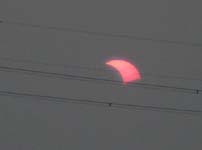 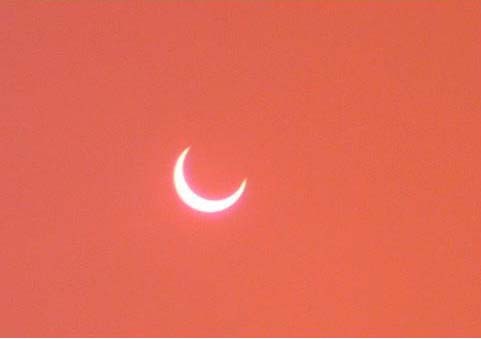 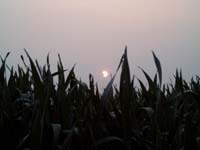 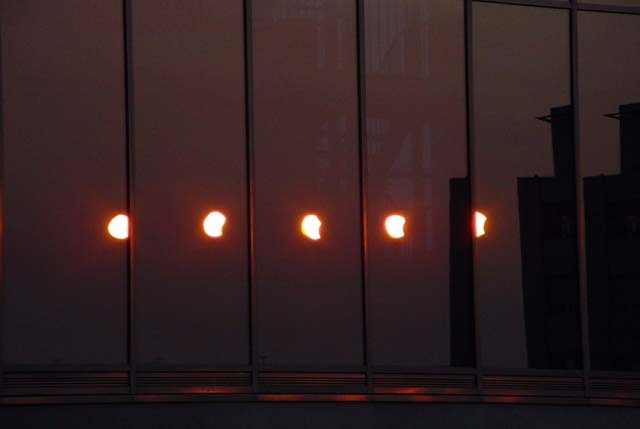 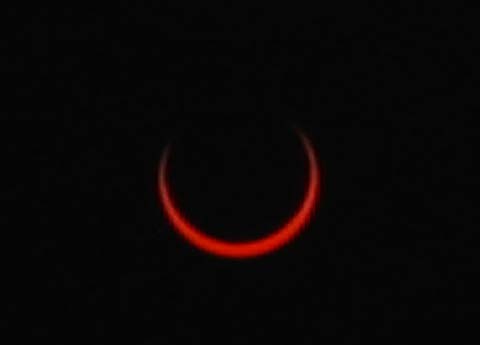 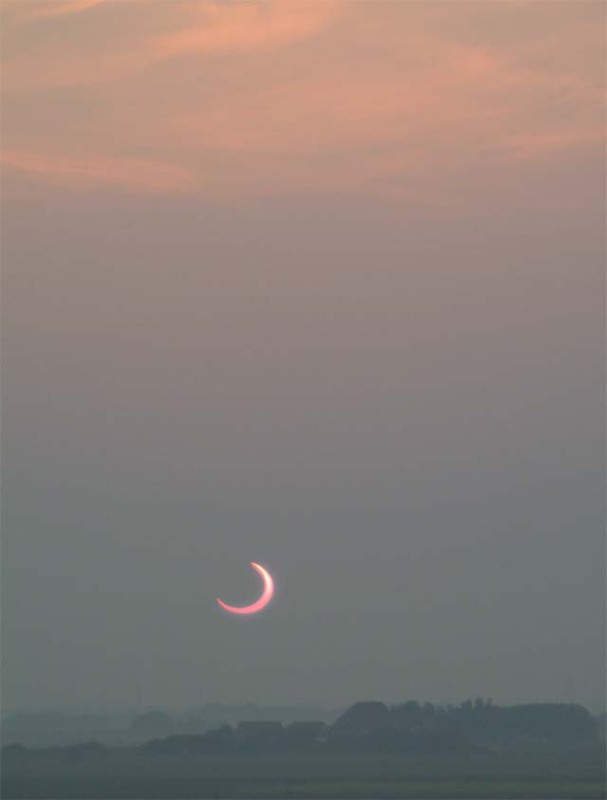 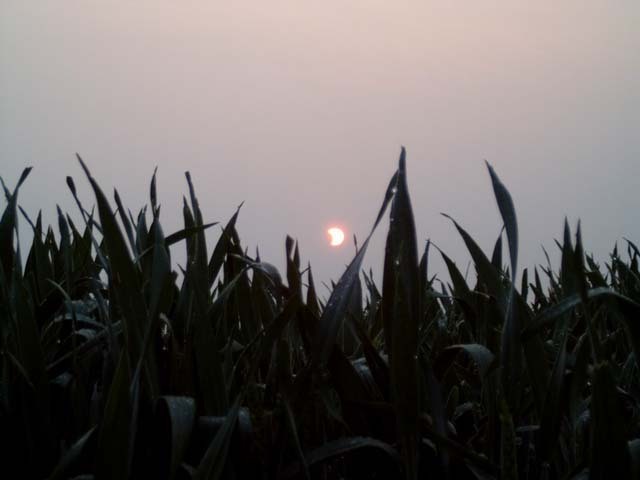 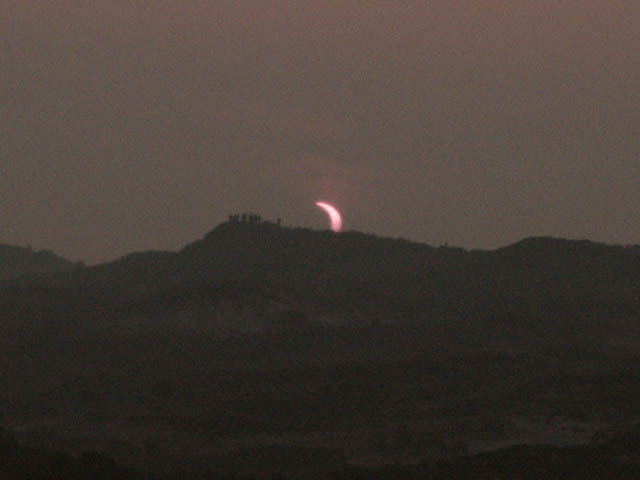 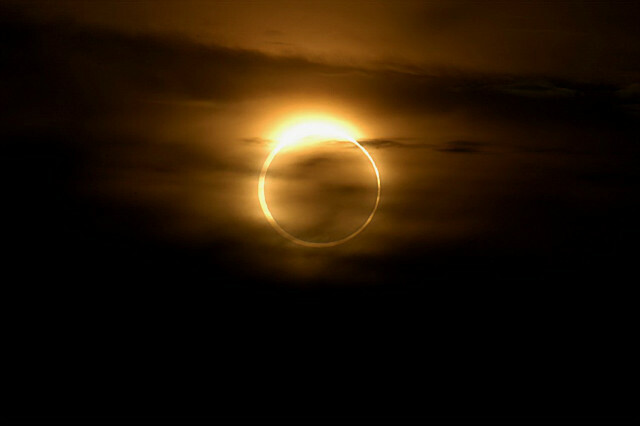 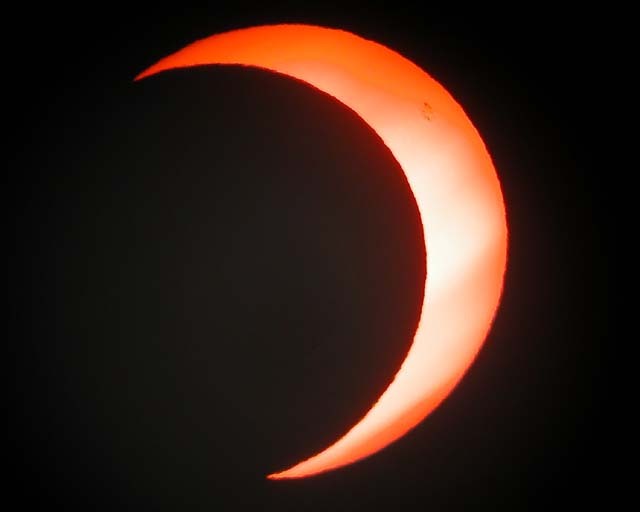 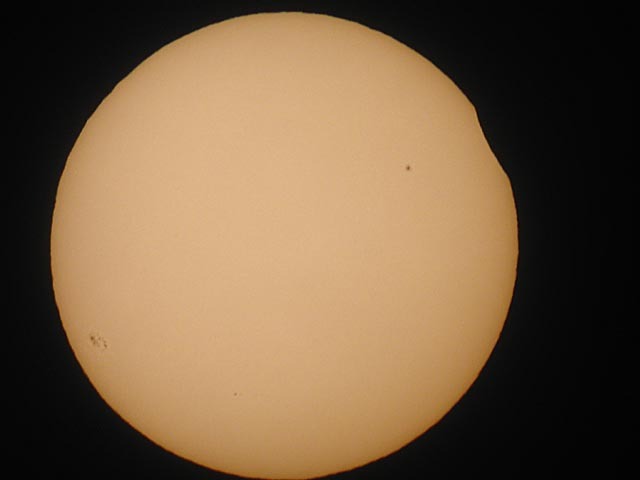 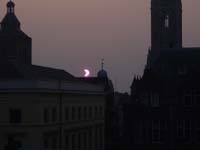 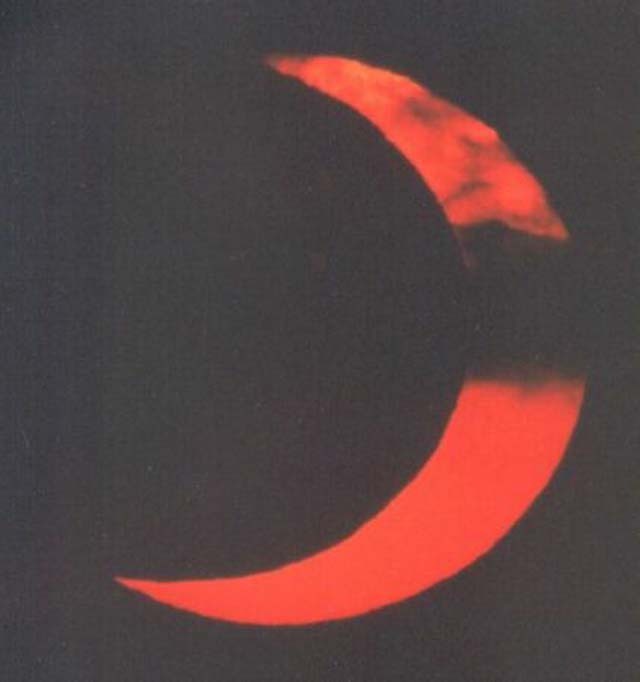 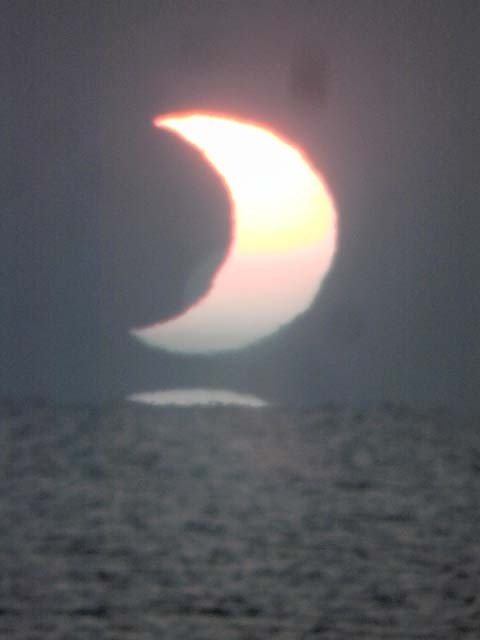 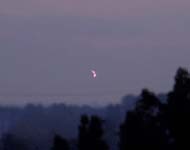 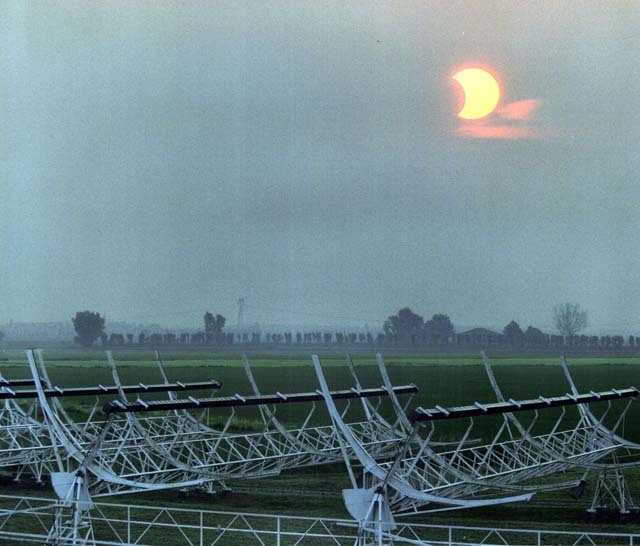 In central and southern Europe the Sun roses partially eclipsed and just part of the event was visible. 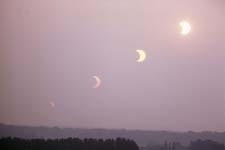 moving across the Earth during the eclipse. by the moving red spot. 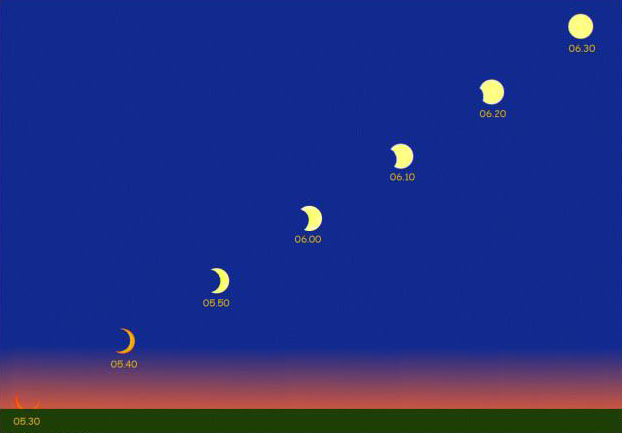 Click for full animation. 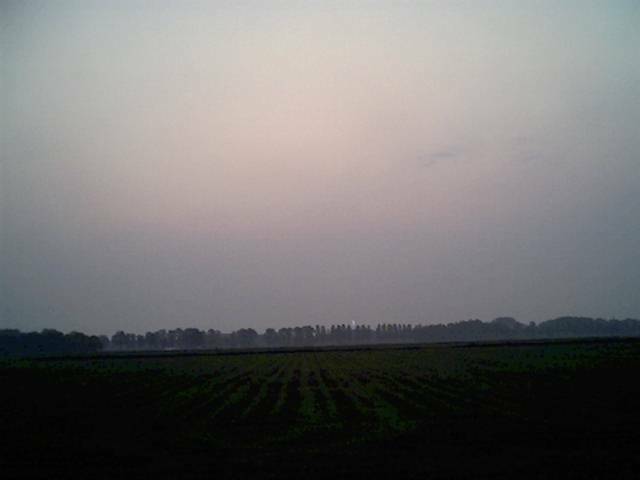 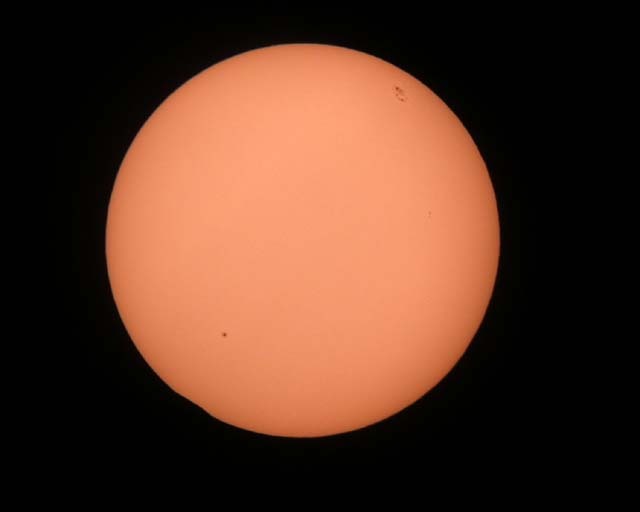 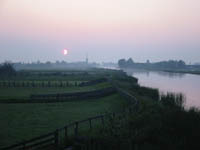 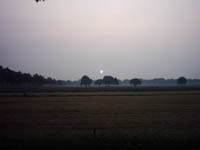 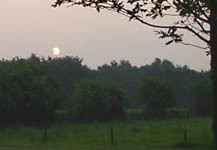 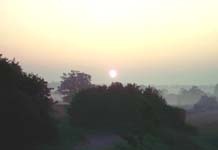 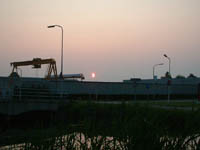 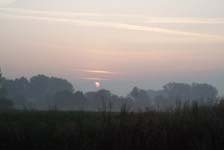 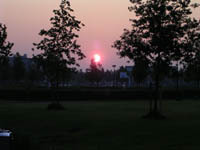 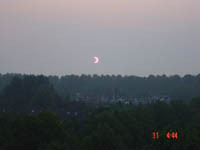 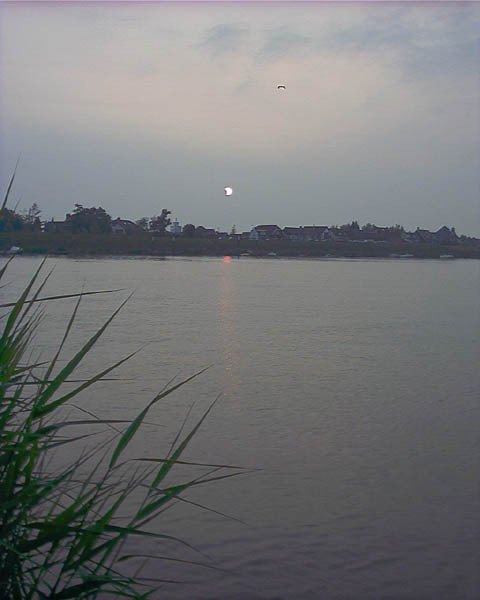 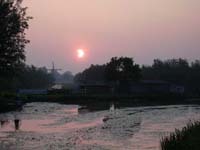 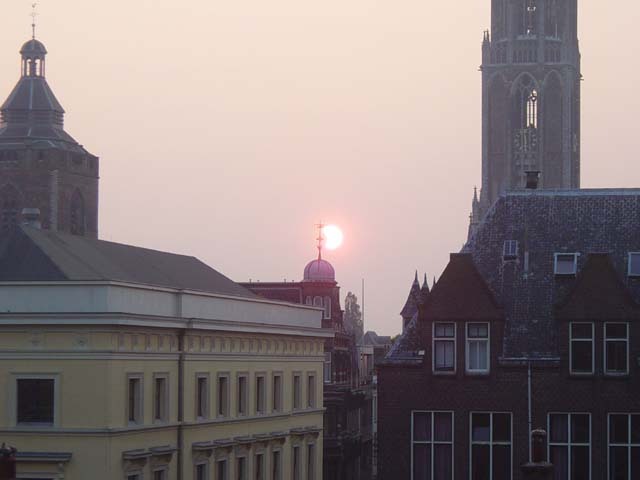 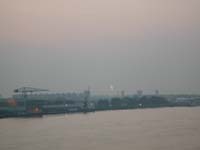 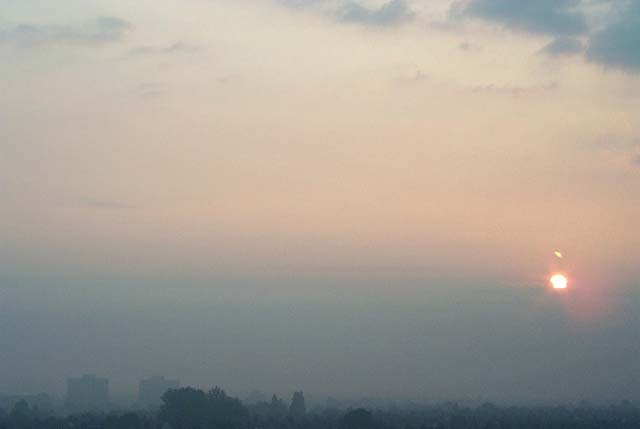 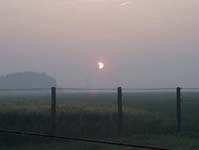 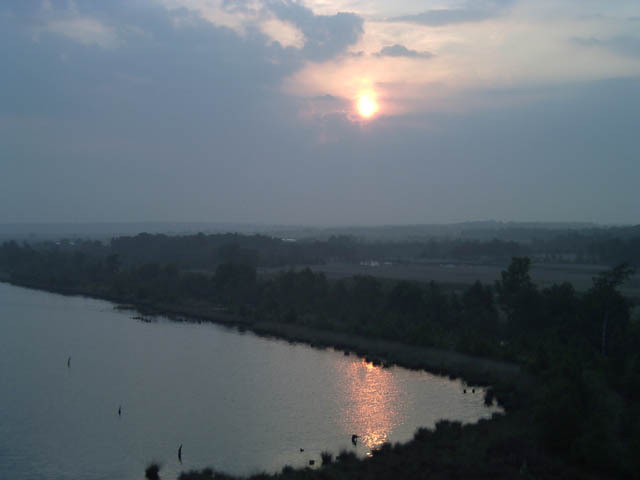 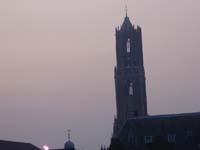 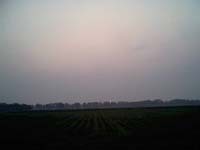 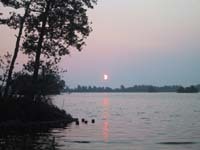 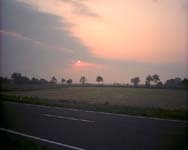 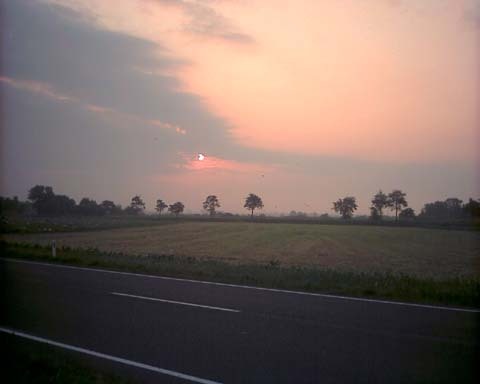 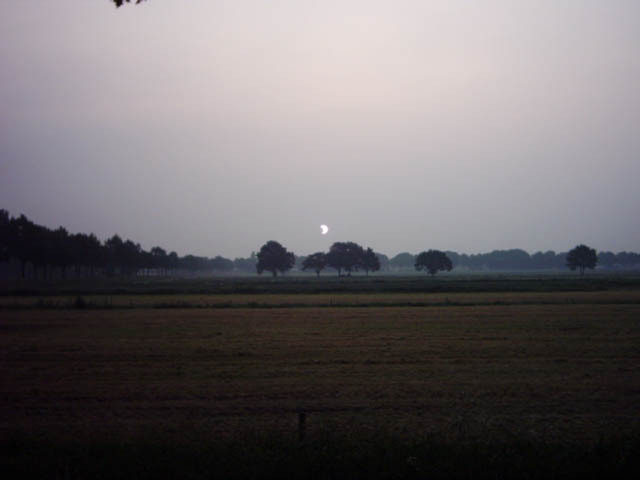 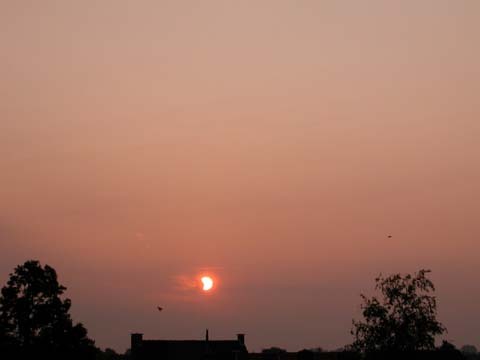 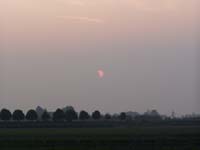 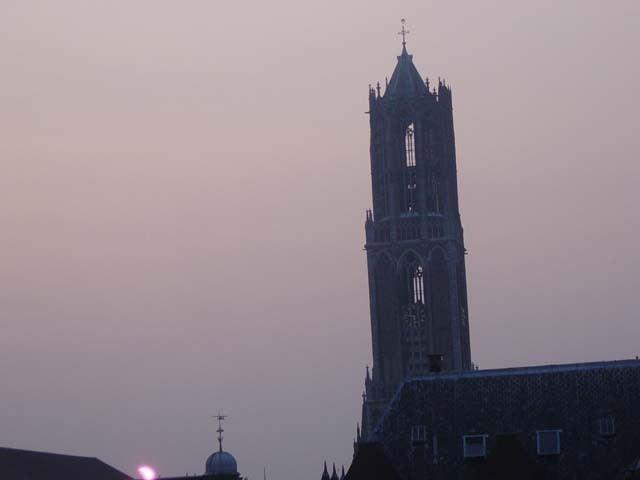 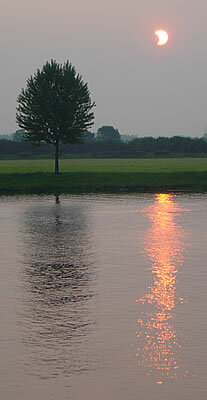 In The Netherlands and Belgium sunrise occured at 3:26 and 3:36 UT respectively. 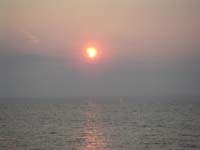 The greatest magnitude was almost at sunrise. 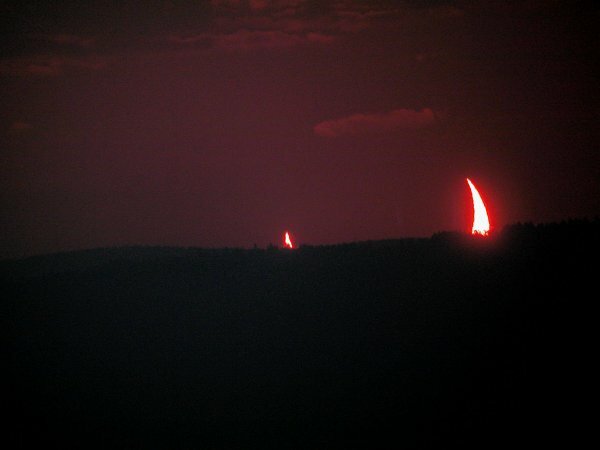 Therefore two tiny horns of a solar crescent rose from behind the horizon. 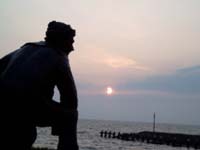 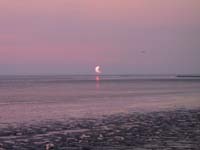 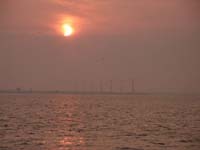 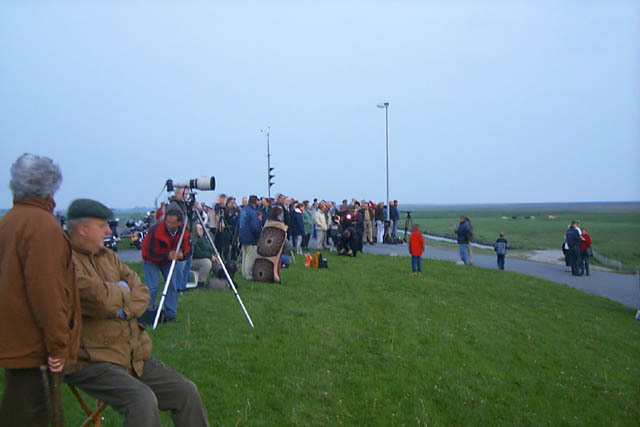 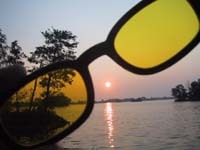 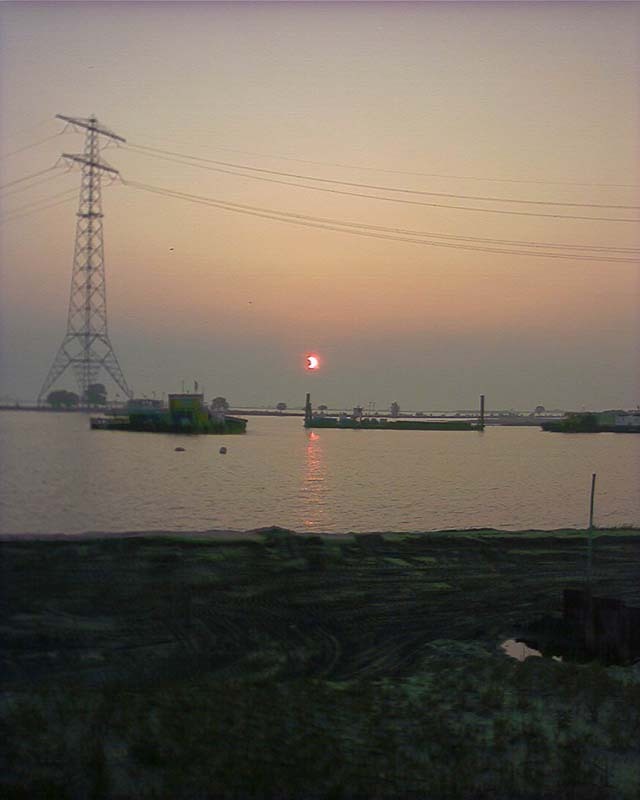 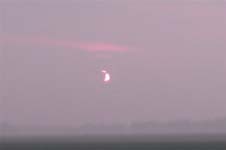 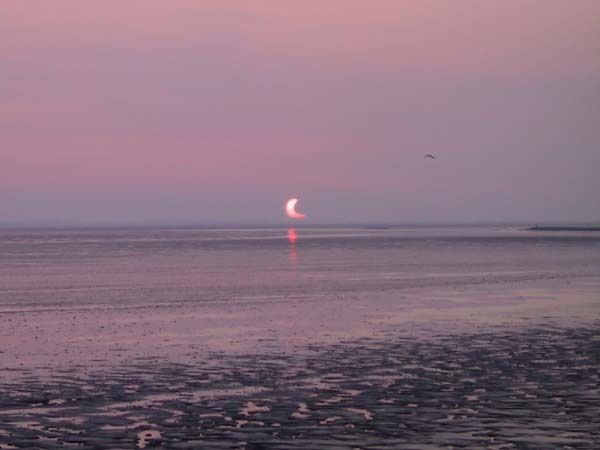 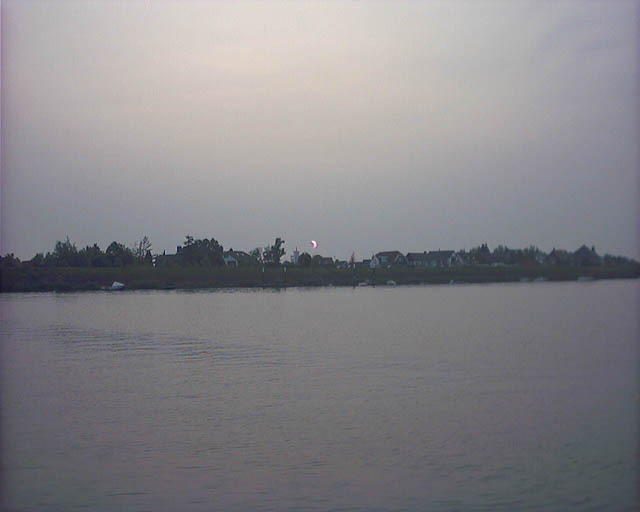 Many observers in The Netherlands gathered along the western shore of the Southern Sea ("IJsselmeer") where there was an unobstructed view of the northeastern horizon so they could catch a glimpse of this rare phenomenon. 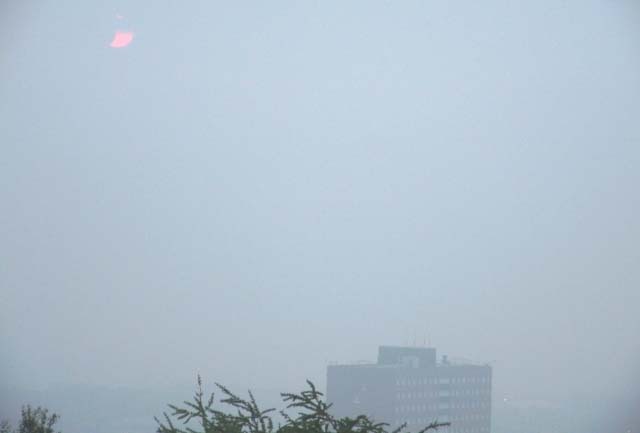 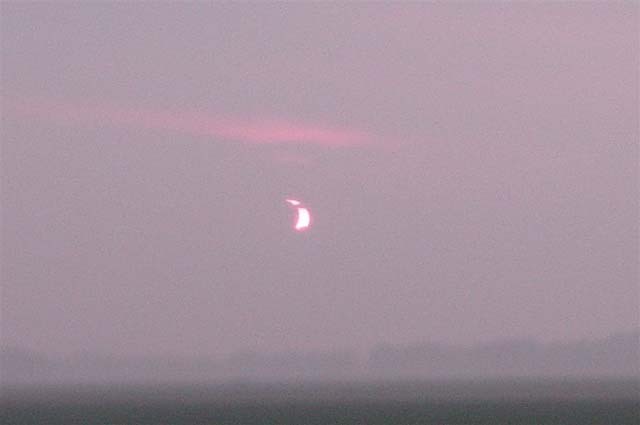 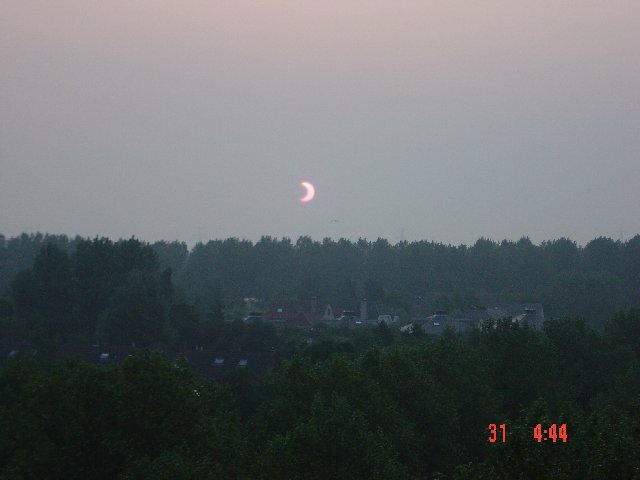 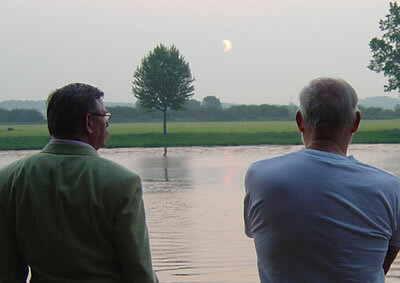 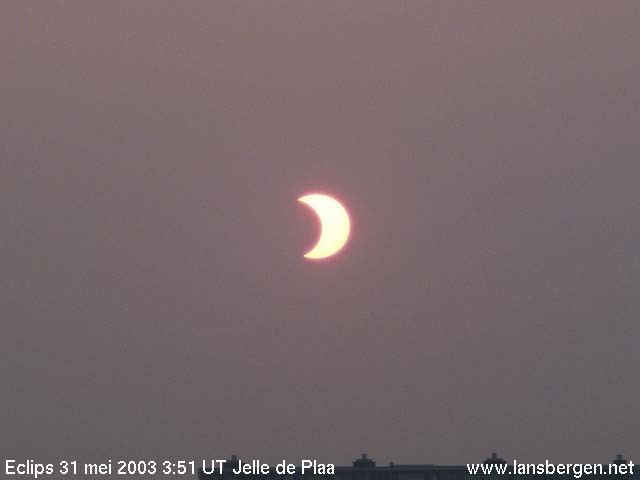 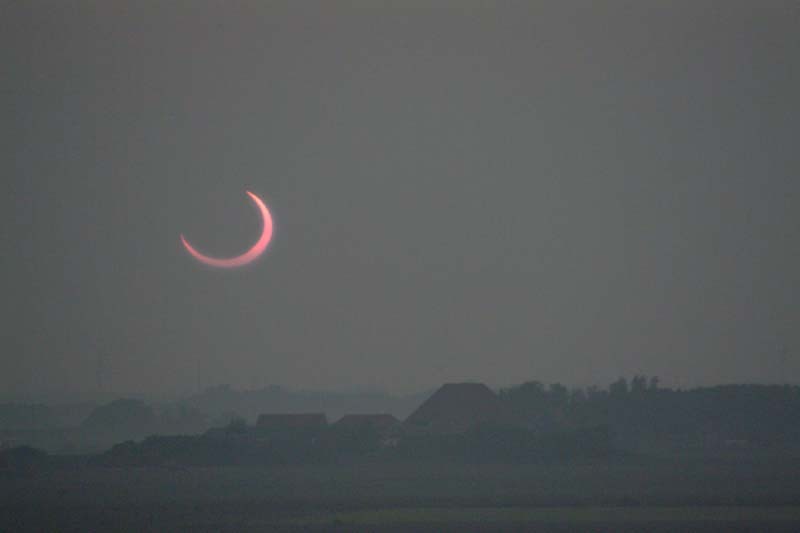 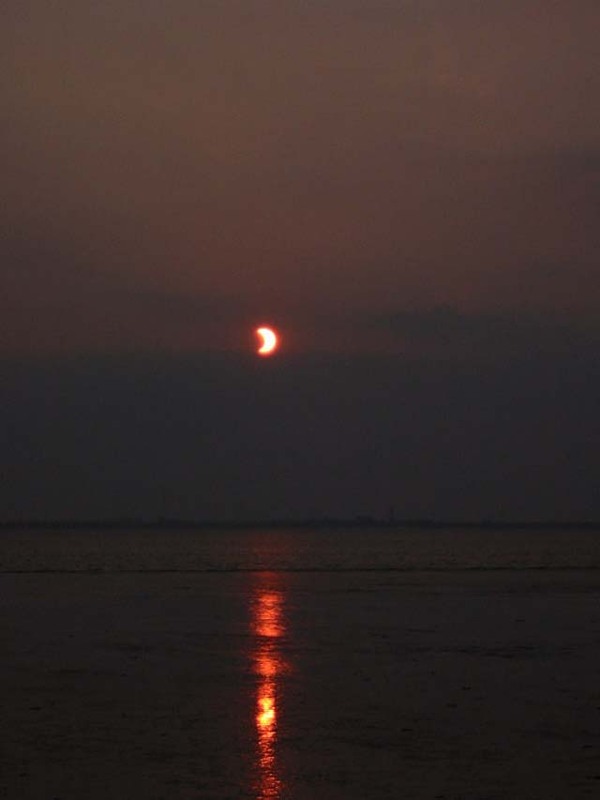 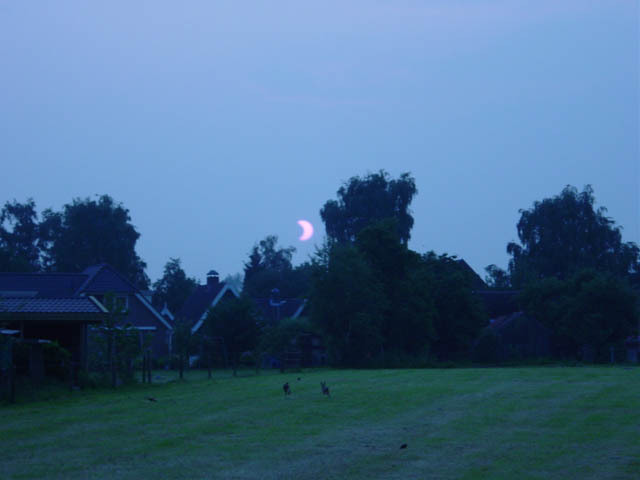 The eclipse in The Netherlands. 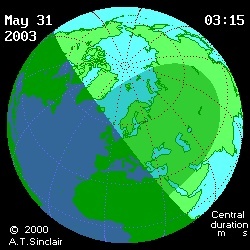 Times are in UTC + 2. 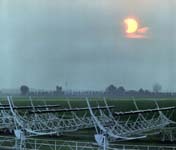 Another live webcasts was organised by Astronomy.no. 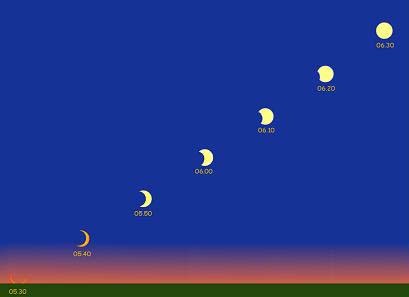 The Norwegian Meteorological Institute recorded the temperature, minute by minute during the eclipse.